It’s the time of year when people make resolutions to improve their fitness and become more active and what better way than by joining a local walking club. Becoming a member of a group such as the Galtee club costs a fraction of the price of gym membership and has the added advantage of getting you out in the fresh air and the beautiful nature that surrounds us. Two club groups were out to experience that nature on Sunday last. Thanks to Thos O’Neill for a combined A and B outing where the 12 walkers stayed off the high ground to avoid the strong winds and instead completed a forest track loop on the eastern Galtees. Thanks and well done also to Pat Kinane, leading his first C walk with the club. Pat took the 20 strong group on a 2 hour loop around by Rock an Thorabh with a 40 minute extension west of the road for those who wanted a little bit more. Thanks to Ray Coleman and Danny Bailey for the walks on Christmas Day and St. Stephen's Day. On Sunday next A walkers meet at Galtee Castle car park at 10am with Joe Browne and Danny Bailey’s B walk meets at Rock an Thorabh car park for a trip to the Dolmen, also at 10am. A and B walkers on Thos O'Neill's walk on Sunday, January 5th, 2014 stand in front of an overturned tree after the storms of recent days. “Are we all crazy or what?” was the question on many people’s lips as walkers gathered in the wind and rain on Sunday last. Crazy or not, 19 people turned up for Danny Bailey’s B walk on Slievenamuck, taking in the Dolmen and the Nature Park among other places, all the time accompanied by the sound of running water and the wind in the trees. Thanks to Danny for finding the driest tracks on such a wet day. 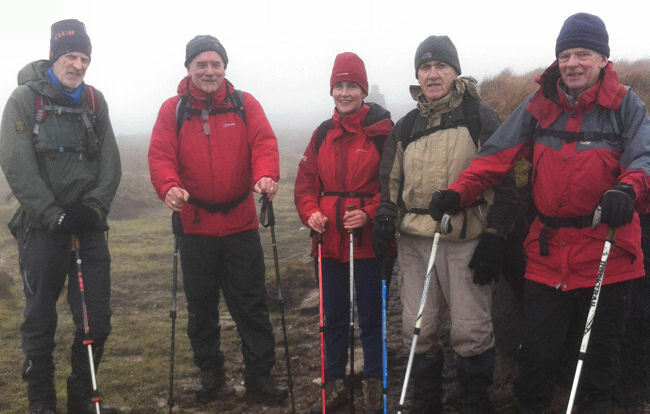 On the exposed Galtees conditions were even worse for Joe Browne’s A walk from Galtee Castle. Undeterred, however, the 8 hardy individuals completed a 3.5 hour loop taking in no less than 3 fast-flowing rivers, the Blackrock, the Glounreagh and the Attychraan. Along the way they climbed the zig-zag track to the col between Bengower and Carrigeen Mountain and crossed the Attychraan on the recently installed footbridge. Many thanks to Joe. On Sunday next the A walkers meet with Pat Ryan at Grubb's Monument at 10am, the B group meets with Roger Lonergan at Rossadrehid Waterworks, also at 10 and Therese Roche meets the C walkers at Bansha Woods Car Park at 11am. The members of the club would like to express their sympathy to Rita Hickey on the death of her mother and to Alec Lee on the death of his father last week. 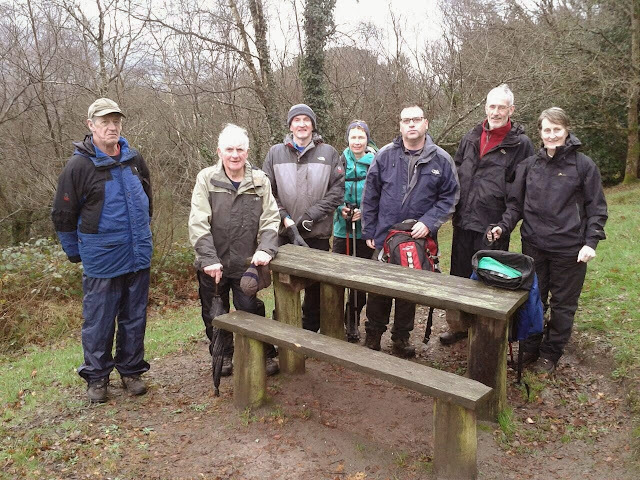 B walkers on Danny Baileys walk on Sunday, January 12th, 2014 at the entrance to the Nature Park near Aherlow House. Preparations are well under way for the Glen of Aherlow Winter Walking Festival, which takes place on the first weekend in February. 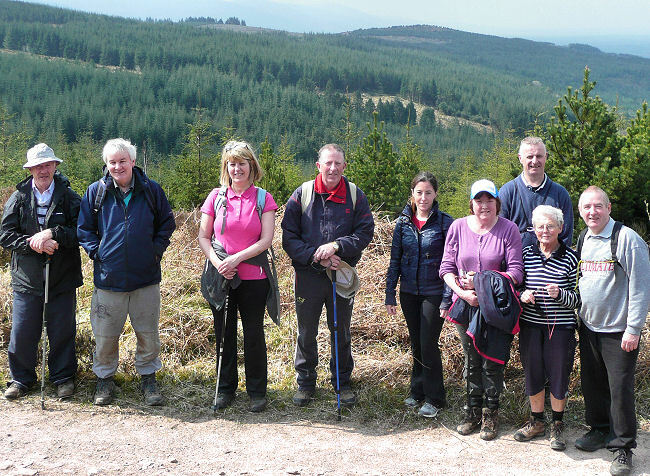 This event, organised by Aherlow Fáilte and the Galtee Walking Club, has a total of nine walks to choose from ranging over the Galtees and Slievenamuck. The grade of walks ranges from difficult to easy so there is something to suit everyone. The easier routes would make a great introduction to walking for anyone considering taking up the activity for the New Year. Thanks to our three leaders, Pat Ryan, Roger Lonergan and Therese Roche for the club walks on Sunday last. Pat’s 5.5 hour, 22km A walk was in the snow covered Knocklmealdowns and took in the Sugarloaf, Knockmealdown and Crohan-West, returning by the Liam Lynch monument, the Tipperary Heritage Way and St. Declan’s Way. 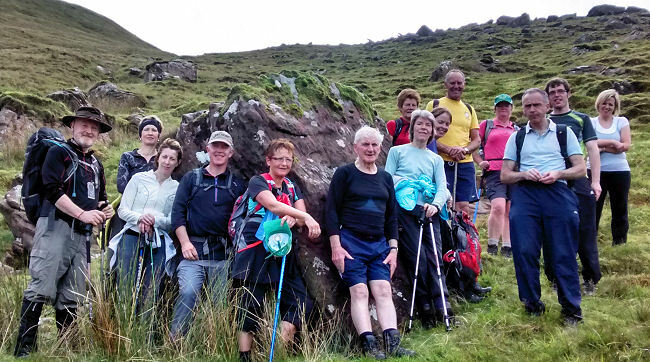 Roger was in the Galtees for a high loop around Lake Muskry with the B walkers and Therese had a great turnout of 36 for her C group visit to Bansha Woods and the Millennium Stone. Both walks on Sunday next start from Clydagh Bridge at 10am. Mike Moroney heads for Galtymore with the A group and Brendan Sheils takes the B walkers to Lake Diheen. C group at the Millennium Stone on Therese Roche's walk in Bansha Woods on Sunday January 19th, 2014. 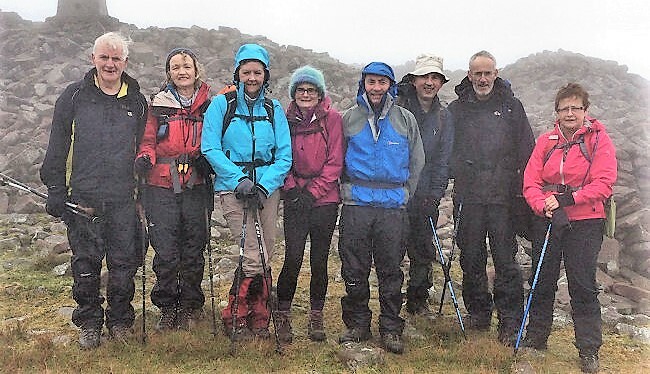 A hardy bunch of A walkers braved the gales and the hail showers to complete a high level loop on the Galtees on Sunday last. Mike Moroney’s route brought them from the start at Clydagh Bridge up by Carrignabinnia then east along the top to snowy Galtymore and Galtybeg before descending beside Lake Borheen and Cush. Thanks to Mike who will be doing something similar next weekend for the Winter Festival. Here is Mike's own description of the walk. Sunday’s A walk on the Galtys commenced from Clydagh Bridge with 15 walkers, moving swiftly onto Drumleagh borheen before reaching open moorland in Moneynaboola, heading southwest towards the Rock of Eaglais on the slopes of Knockmoyle. One got a sense that this walk would excite all the senses. Enveloped with a feeling of boundless freedom the group crossed the Glounegarriff river on the Tipperary Limerick border in Ballygeana valley with its lush green meadows, plenty of fresh air and breath taking views of the Glen of Aherlow. It was from here that our unforgettable mountaineering adventure began in earnest, enduring snow and gale force winds. We climbed towards the track near the Glounnageeha river in Baunteen on our endeavours to summit Carrignabinnia mountain our first peak of the day. At this point 6 of the group decided for option one which was back the valley on a 500 metre contour. For those who summited Carrignabinnia it was gale force winds at our backs as we quickly conquered Slievecushnabinna, Galtymore the highest point of the day and finally Galtybeg. At the ‘Geata Step’ we abandoned the option of the balcony above Boreen Lough as the prevailing gale force winds were extremely hazardous. Our alternative return by Cush Mountain to our cars completed the 18km walk. Enduring 5½ hours of inclement weather and a climb of 1290 metres in energy sapping conditions was one way of concluding that, January brings the rain, thaws the frozen lakes again! Thanks to all who ventured forth today, good company makes it all so enjoyable and worthwhile. Brendan Sheils also started from Clydagh with his group of 8 B walkers and they completed a 10km circuit around Cush Mountain in 4 hours, again experiencing the strong winds, snow and hail along the way. The clockwise circuit brought them along the firebreak at the northern base of Cush, then south at at Corrigeen rock outcrop, along Boula glen and over the col between Cush and Galtybeg before returning by the Galtee stile and forest tracks. Thanks to Brendan who sensibly changed the original plans, given the poor conditions. Next weekend is a busy one for the club with many members either leading or stewarding the nine walks of the Glen of Aherlow Winter Walking Festival. We hope to see as many people as possible from Tipperary and surrounding counties come out to enjoy what should be a great occasion. Mike Moroney's A walk to Galtymore, Sunday January 26th, 2014. B walk around Cush Mountain, Sunday January 26, 2014, leader Brendan Sheils. Winter certainly made itself felt during the Glen of Aherlow Winter Walking Festival last weekend as strong winds, rain and snow kept the numbers participating down on previous years. On Saturday in particular, many of the walks had to be rerouted or amalgamated because the high ridge of the Galtees was not a safe place to be. Sunday was a much better day, especially for the low level walk on Slievenamuck but those who ventured onto the Galtees still had the wind and lying snow to contend with. Despite the conditions the event was successful and incident free and the total of 362 walkers who participated over the two days had a genuine winter walking experience. 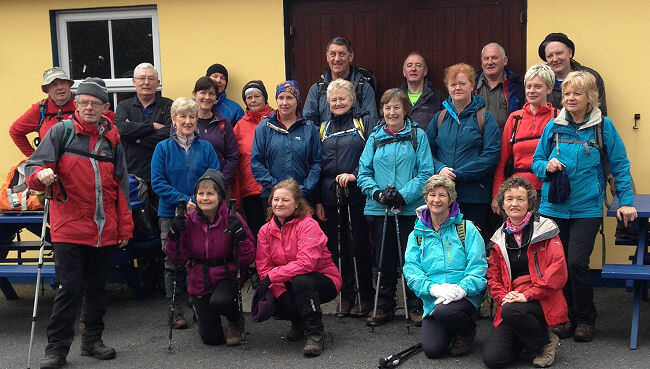 On Sunday next the club A walk is to Carrauntoohil, meeting with Breda Noonan at Daly’s garage, Killarney at 9:30am. Eddie McGrath’s B walk meets at Christ The King Statue at 10:30am and Mary O'Dwyer meets the C group at Bishop's Wood Car Park, Dundrum at 11am. Thanks to our three leaders, Breda Noonan, Eddie McGrath and John O'Dwyer for our walks last Sunday. 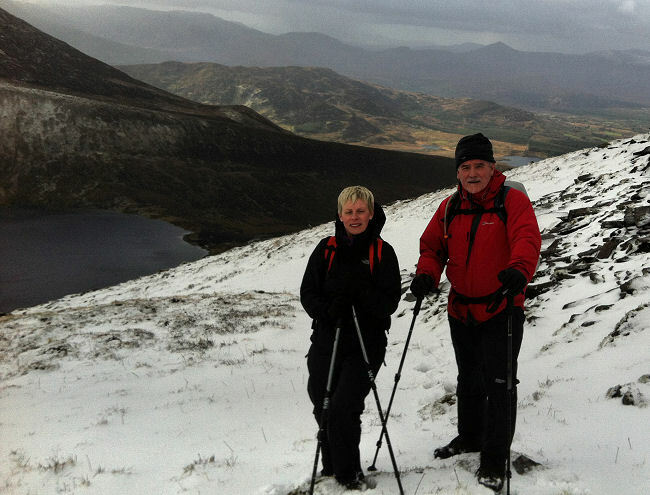 Breda was on the Macgillycuddy's Reeks in Kerry and this is her own report on the walk. Our party of three met at Daly’s garage and we headed for the new car park at Breeblee, a little north-east of Lough Acoose. Beautiful morning the sun was shining and the views were spectacular. We headed up the hydro road from the car park to Coomloughta Glen with its 3 lakes, Lough Eighter, Cooloughra Lough and Lough Eagher. We climbed Skregmore West Top (747m), Skregmore (846), Skregmore East Top (851), Beenkeragh (1010), Beenkeragh, meaning mountain/peak of the sheep. We had to contend with strong winds and heavy snow/hail showers on the way, again another weekend of experiencing winter walking. Icy conditions prevented us reaching the summit of Beenkeragh, we decided to turn back a few meters from the top, safety first. We descended Beenkeragh and Skregmore East arriving at Lake Eagher, where a lengthy break was enjoyed taking in the sights. Returned to the car park following a walk around lakes Cooloughra and Eighter. A very enjoyable day was had, spectacular views and good company. Walk was 12Km, Ascent 950 Metres, and Completed in 5hours. Eddie's B walk was on Slievenamuck where 19 people completed a very enjoyable loop, starting from Christ the King statue. The C walkers got lucky when the day cleared up to provide dry and sunny conditions for walking. Mary O’Dwyer's walk in Dundrum Woods was led by her husband John, who provided a lively 2 hour circular trek around this impressive stretch of woodland. 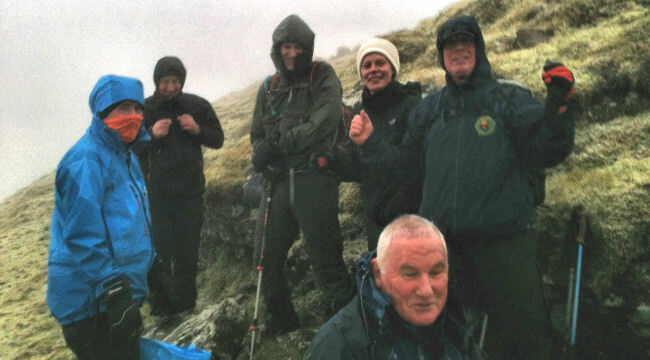 15 people turned out to enjoy a welcome break in the outdoors after recent stormy conditions. Spirits were high and the company jovial as they stepped it out through the still and deserted forest, past the International Scout Centre and stopping for a short lunch break at the halfway point. With thanks to John for graciously facilitating this and best wishes to Mary for a speedy recovery. 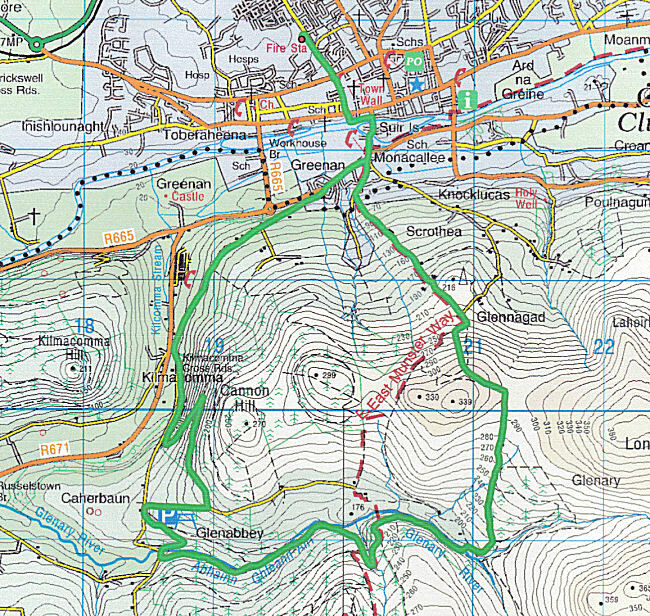 Next weeks walks: Sunday 16/02/14. Liz Breen will lead the A walk, meeting at Cappawhite Church at 10am for 4 hours forest tracks around Red Hill. The B walkers should meet Liam Doheny at 10am at Kilcash Village for an extended climb of Slievenamon. Mo larkin will meet the C walkers at 11am in Glengarra Woods car park. Liz Breen, Liam Doheny and Mo Larkin provided the club walks last Sunday during a respite from the recent turbulent weather conditions and we thank all three for their leadership. Mo and the C group of 15 were in the lovely Glengarra Woods, surprisingly calm and relatively undisturbed, except for some fallen rhododendron branches and an extra busy Burncourt River. A two hour loop of the river was achieved under threatening skies but all got back dry and in good form. Liam took the B group of 19 up onto a foggy Slievenamon from the Kilcash side and then north to Sheegouna and through the woods at Carrignagapple where the recent storm damage was all too evident. A visit to the Mass Rock completed the 12.5km, 4 hour linear walk. Liz took the A walkers from Cappawhite through forest tracks to Red Hill. 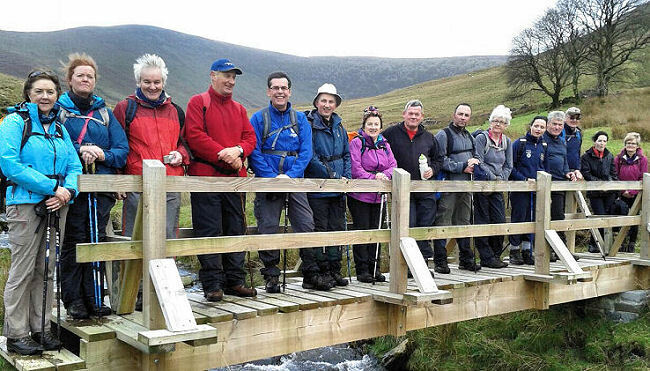 On Sunday next, February 23, the A and B walks meet at 10am at Clydagh Bridge for walks in the Galtees with Paul Ryan and Pat Donovan. 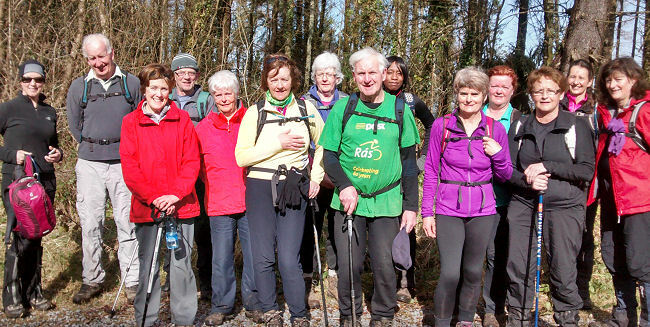 Liz McNamara will meet the C walkers at the Mountain Road in Cahir at 11am for a woodland walk. After a stormy Saturday night, surprisingly benign conditions on Sunday allowed for some good walking. Leading out from Mountain Road Cahir, Liz McNamara provided a most enjoyable three hours C walk for a dozen walkers through Scarrough Woods, taking in a round of the Bane mountain foothills overlooking Cahir, where sadly, many old Scottish pines lay stretched across the forest floor and along the forest paths. Visibilty was good and stretching south, the flooded fields were all too visible. All were grateful for this spirited walk in the fresh mountain air and well done Liz for her gracious and careful navigation. Paul Ryan was also out with a select group of A walkers in the Galtees, completing the Cush Horseshoe in dry but windy conditions. They extend thanks to Pat as pacemaker. The B group had a trip to lake Dineen with Pat Donovan. Blown around a bit but got home dry. Roger and Brendan's help greatly appreciated. Next weeks walks: The A walkers meet with Anthony O’Brien at Kilcoran Lodge Hotel at 10am and Catherine Russell will meet the B group at Rossadrehid Waterworks, also at 10am. 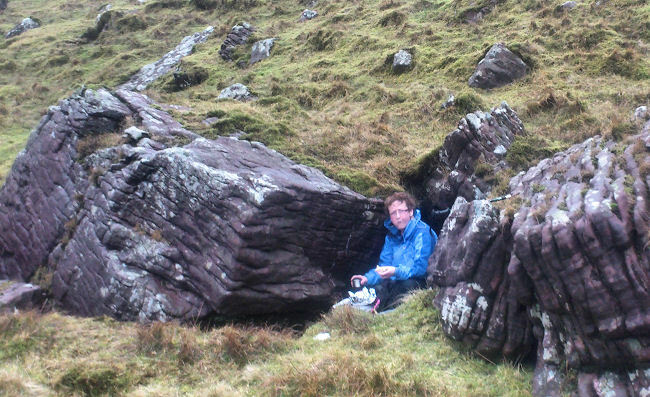 Helen taking a break for lunch between the rocks on Pat Donovan's B walk to Lake Diheen, Sunday February 23rd, 2014. A band of heavy rain with an unfortunate sense of timing coincided with the start of the two club walks on Sunday last. 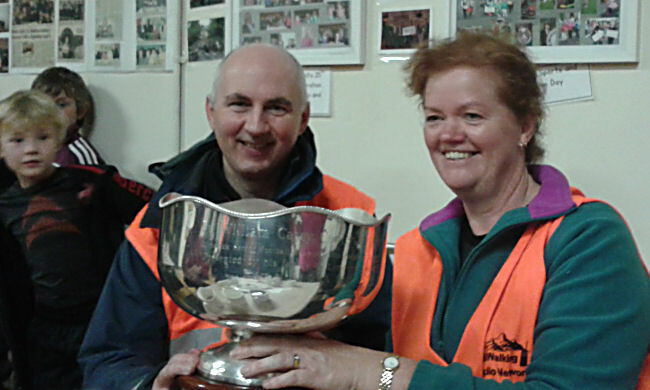 It led to difficult conditions on both sides of the Galtees for walk leaders, Anthony O’Brien and Catherine Russell. Anthony’s A walk started from Kilcoran Hotel on the southern side, while across the mountain, Catherine’s B walk began at Rossadrehid waterworks. The other waterworks from the sky continued as the group of 17 headed for Lake Muskry on the track that had become a flowing stream in many places. The river, which crosses the path near the lake, was in such flood that Catherine decided to put the safety of the group first and not attempt a crossing. On the way back the rain stopped and by the end the sky was blue and the sun was shining. Our thanks to Catherine and also to Anthony. On Sunday next the A walk meets at 10am at Melody's Bar, Ballymacarbery with Owen Ryan, the B walk meets at Rock an Thorabh Car Park with Gerry Ryan also at 10am and Cecelia O'Heney takes the C walk, meeting at the Lady Gregory Pub, Kilmoyler at 11am. 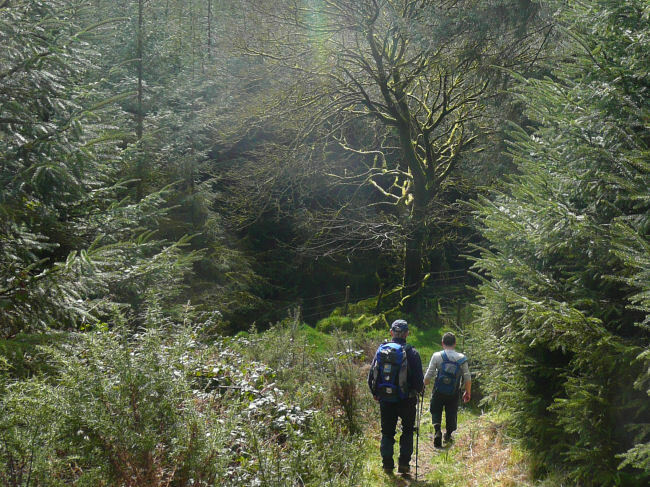 Enjoying the sunshine on Catherine Russell's B walk from Rossadrehid Waterworks, Sunda​y March 2nd, 2014. The promise of more settled weather brought many of our walkers back onto the hills with over 50 people out overall to enjoy mild and dry conditions. The C group, led by Cecelia O’Heney, had 24 eager trekkers and they certainly got their lagging fitness levels back on track after 3 hours on the Bane foothills with plenty of fallen tree obstacles to navigate. Cecelia navigated along and across the track levels, which offered relatively clear circular views over the hinterlands of Cahir, Clonmel and Cashel. A highly sociable outing with plenty of chat and mini breaks and always a helping hand from Cecelia to get the group around or over the fallen trees. Much appreciated. Gerard Ryan had his inaugural walk as leader with the club when he navigated 19 walkers across the Slievenamuck Ridge from Rock an Thorabh car park to Lisvarinnane and back. This was a fast paced B walk covering over 12kms in under three hours. Some novel routes were taken in as they made their their way past the Mass rock, up onto Slievenamuck, past the Shrough dolmen, down into Lisvarinnane. A sociable break was had here and the flavour of the day was wine gums all round, courtesy of Gerard! Then back via Ballinacourty and the long and challenging road end up to Aherlow House. Owen Ryan's A walk was in the Comeraghs. 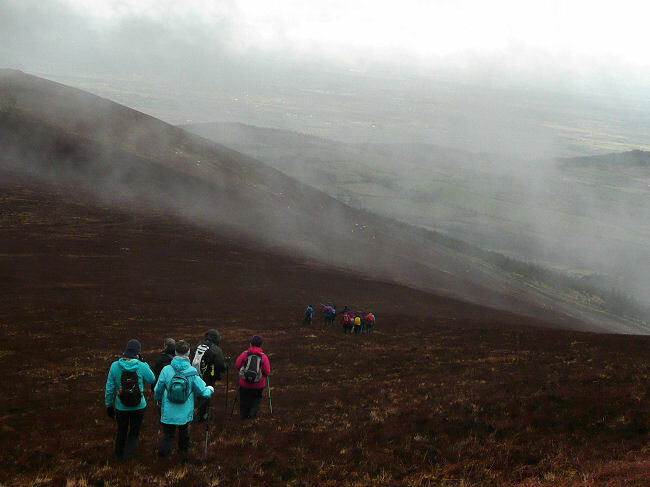 After meeting in Ballymacarbery the group of 8 began the walk from the Nire car park in fresh, windy and foggy conditions by following the waymarked route to the Gap. They made the steep ascent to the plateau and the cairn over Crotty's Lake. Here the visibility was down to 10 meters and getting worse requiring good navigation skills. From the cairn the group headed in a south-westerly direction taking in spot points of 743 and 751 and circled around the cliff tops above Coumfea. They descended the ridge at Lyremountain to the stepping stones and a Nire river crossing by the trailer bridge. In all this was a demanding 18km loop with 835 metres of height gain completed in under 6 hours. Owen would like to extend best wishes to Noreen who suffered an accident during the walk and thanks to Diarmuid O'Grady who provided assistance with his 4x4. Notice: The committee met last week to agree the new schedule of walks, now on this website. Preparations for the up coming marathon on April 13th were also put in place. Helpers will be needed for this event. 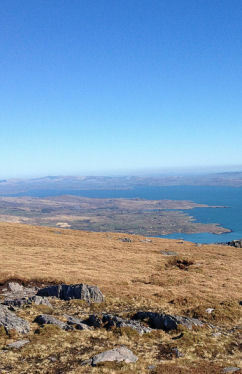 Note too that a group from the club will be on their way this weekend to complete the first three sections of the Beara- Breifne Way from Dursey to Glengarrif. We wish them all the very best. No local walks are scheduled for this weekend. 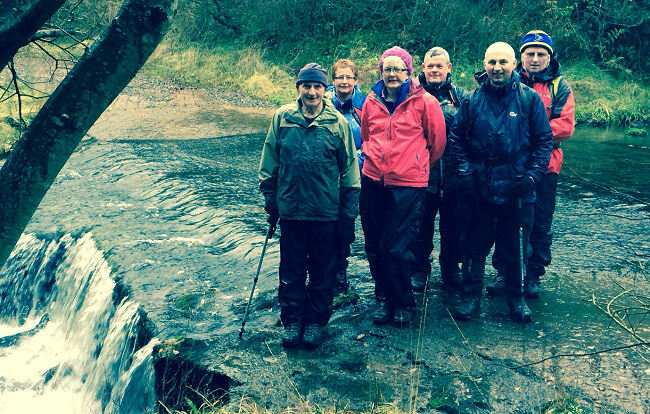 Poem written by a Galtee Walking Club member who happens to be in the photo below. After a wonderful St. Patrick’s weekend on the Beara Way in west Cork, which even inspired one member to compose poetry, it was back to the regular walks on Sunday last. Rody Tierney’s A walk was on Slievenamuck in preparation for his upcoming Marathon on April 13. In brilliant sunshine the large group of 23 covered the western section between Rock an Thorabh car park and Moor Abbey, enjoying great views of the snow-capped Galtees. Underfoot conditions were good despite the recent rainfall and it appears the course is ready for the big day. After a lively pace around the course all were back in time to see Tipperary achieve their long awaited win. Peig McGrath was to lead the B walk, but due to a recent knee operation her husband Eddie and sister Mary deputised for her taking a group of 13 on a loop around Devil’s Bit mountain, with a climb to the cross at the top. This walk, which was new to many participants, had much to offer including great scenery and 360 degree, long distance views with added bonuses of paragliding and hang-gliding displays and refreshments provided at The Ragg afterwards. Peig would like to thank Eddie and Mary for leading the walk, she thanks the staff of the Ragg Lounge for the lovely refreshments, and thanks Vinnie for the beautiful cake and she hope to be back walking in the near future. And lovely to meet newcomer Mary Rourke. Breda Delahunty’s 14 C walkers enjoyed a wooded loop from the Lady Gregory taking in St. Peacaun’s Church, well and cell and the Toureen area west of Cahir. At times the forest road resembled an obstacle course where old Scottish pines lay stretched across the track. The cheerful band of walkers negotiated their way over some, under others and around the remainder!! Well done, you are all now ready for bootcamp! Visibility was good providing excellent views as far as the Devil's Bit and beyond. Our thanks to all the walk leaders. On Sunday next Rody continues the Marathon preparations meeting at Rock an Thorabh car park at 10am while Pat Butler meets the B walkers in Upperchurch at 11am. There is also a Mountain Meitheal work day on the Curra stile track on Saturday when new helpers are welcome at the meeting point of the Coach Road Inn at 10:30am. 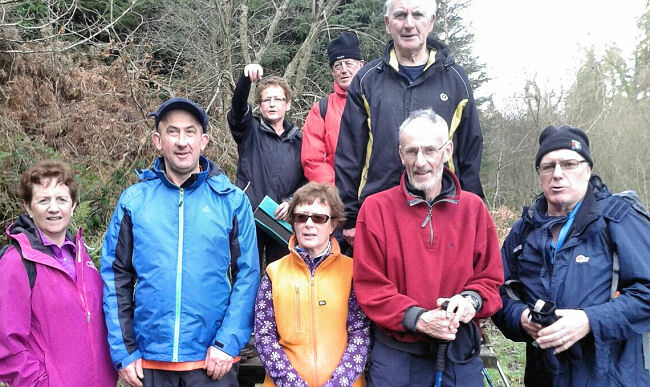 The ‘A’ walkers were back on the Marathon route last Sunday, this time covering the eastern section to Bansha Woods. Here is walk leader and Marathon organiser, Rody Tierney's own report. 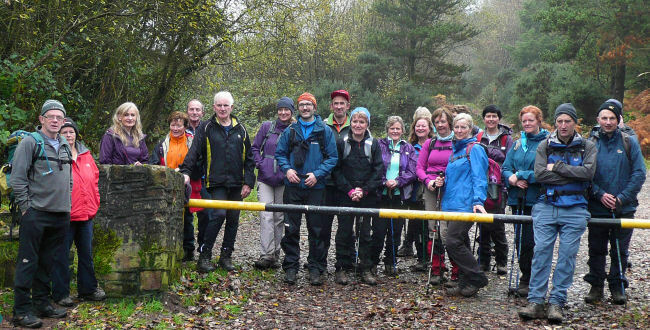 Fifteen walkers turned out to Rock an Tarbh for this half marathon trek. The early morning sun reflecting the splendour of the entire Galtee range as we laced the boots but we were also careful to leave our jackets in the bags. A lively pace brought us to Bansha Woods car park where the force of recent storms was evident all around us as we had lunch and more camera clicking.We circled back along the track over Chapel road and around Bansha castle where Coillte workers have cleared several heavy trees from the circuit. A big thank you to Paul, Gerry and the boys! Thanks to Goretti for the photography and best of luck to Rody for the Marathon on April 13. 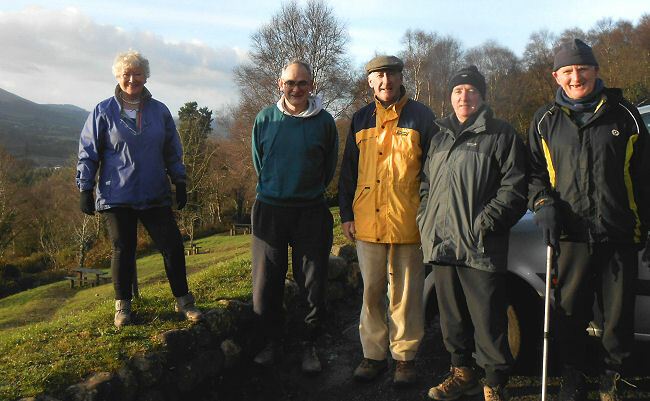 Pat Butler’s ‘B’ walk was a lovely 3 hour circuit through varied terrain on Knockalough hill, south of Upperchurch where again the bright sunlight and clear air allowed for great views of the rolling countryside which surrounds the village, and the higher mountains beyond. Thanks to Pat and also local walker, Tom Ryan for his guidance. On Sunday next Rody is preparing for the Marathon again, meeting at 10am. Ann and Sheila meet the B walkers in Anglesboro at 10am for a trip to Temple Hill and C walkers meet at Cappawhite School at 11am with Patricia Butler. 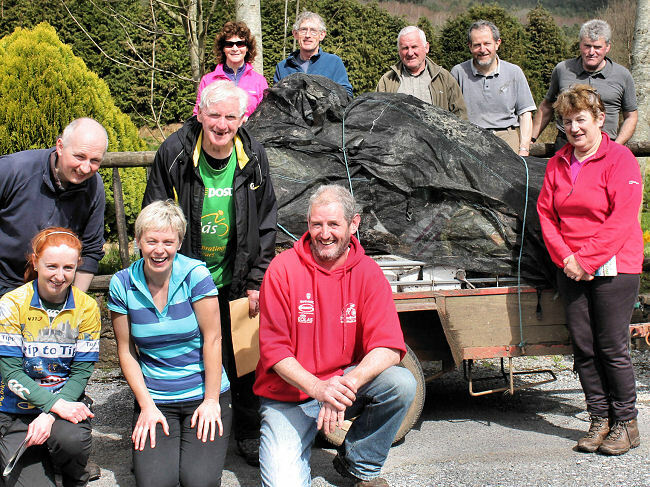 Saturday, April 5 is clean-up day in the Galtees and Glen area and it is hoped that as many members as possible will turn up at the Glen Hotel at 10am to lend a hand. The more people who come the easier the work will be for everyone and in any case it should take no longer than a few hours. The Mountain Meitheal work day on the Curra track on Saturday last saw people come from Wicklow, Cork and Limerick but was sadly largely ignored by Galtee members even though the work was being done in our own back yard. Hopefully the clean-up will not also be left to visitors from outside the area. 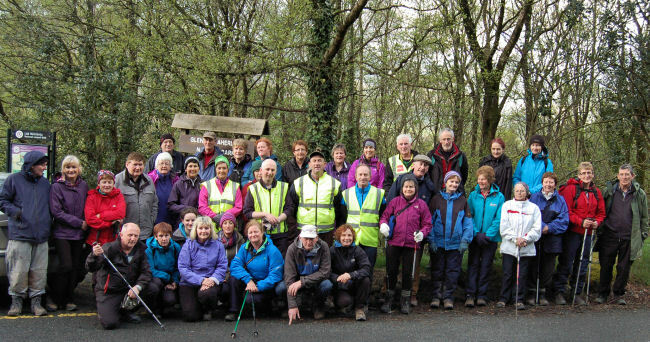 Saturday, April 5th was litter clean-up day in the Glen of Aherlow and parts of the Galtees and was well supported by members of various clubs from around Munster, including the Cork Backpackers, the Limerick Climbing Club, the Ballyhoura Bears and the Galtee Walking Club. After meeting at the Glen Hotel, groups went in different directions to cover areas such as Muskry, Cush and Rock an Thorabh car parks, the Millennium Stone and Christ the King Statue. It was a case of many hands making light work as the bags filled up quickly and at the end of two and a half hours work several trailer loads had been collected. Afterwards there was tea and refreshments for all at the Tourist Office. Thanks to Helen Morrissey for looking after everyone and organising the event and thanks to all who took part. No thanks at all goes to those thoughtless people who made the work necessary by stupidly dumping their rubbish. The first big club event of the year, The Slievenamuck Walking Marathon, takes place next Sunday, April 13th. For those planning to participate, please be at Rock an Thorabh car park for registration from 8am. You can choose the full or half marathon, see the Marathon page for details and it would help if you can download the registration form and bring the completed form along on the day. You need to be a well practiced walker and have some strong walking boots. Organizer, Rody Tierney, has been busy marking the route in the past few weeks and took the A walkers along last Sunday to mark the westerly loop. We wish everyone happy and safe trekking on the day. Also out on Sunday were 25 C group walkers who had a lovely two hour loop hike with Pat and Patricia Butler. It was the best kind of day for walking, not too hot, not too cold, a breeze, blue skies and cotton wool clouds. Their route took them up from Cappawhite to Red Hill and to the highest point at 440metres, where that notable plane went down in 1968. There were many new walkers who joined them and we bid them cead mile failte. Lovely to see such enthusiasm and thank you Pat and Patricia. 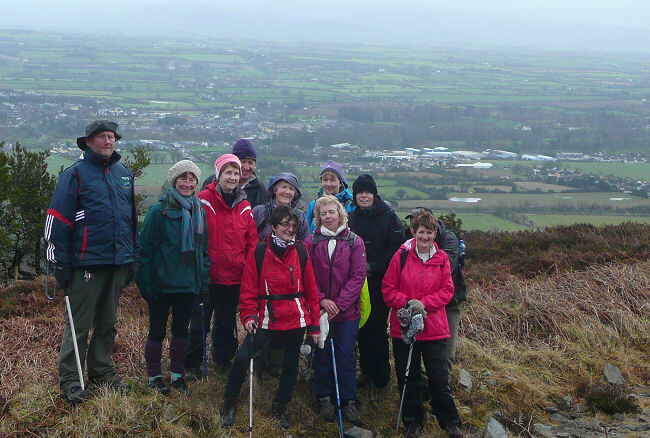 Taking on Temple Hill, Sheila Lenihan and Ann Donohoe took 10 B walkers on a newly opened track up the Lisheen boreen from Anglesborough, via Paradise Hill and The Pinnacle to enjoy amazing panoramic views and a welcome lunch on the summit of Temple Hill. Well done to our two ace facilitators for this special 4 hour exploration. There are no scheduled walks for next Sunday as it’s Marathon day, but the Wednesday evening walk on 9th April provides for a 2hr forest track outing with Sadie, starting from Clydagh bridge at 7pm. 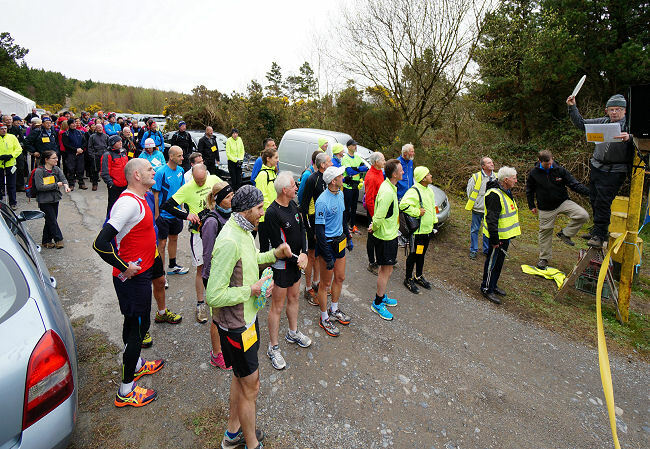 In perfect weather conditions, the club’s annual Palm Sunday Marathon was a resounding success with over 90 people from all over the country and of all ages taking part in this 42km walk across the Slievenamuck Ridge. Starting from Rock an Thorabh car park their route took them west to Moor Abbey and then east to Bansha Woods, ending at the start point at Rock an Thorabh. Meticulously planned by Rody Tierney and fellow club members, and opened by club president, Danny Bailey, the course enabled all to go at their own pace, whether running or walking and this year a sizable group choose the former with the first runner covering the entire route in three hours, forty six minutes, with second and third not far behind. Quite an achievement. But the majority walked, including chairman Owen, with some doing a half marathon and as well as meeting their own individual challenges, most were out to enjoy the beauty of the emerging spring in wood and pastureland. We thank all who took part and congratulate them on their achievements. Thanks to those club members too who manned the base camp at the Rock from early morning and those who kept the checkpoints and refreshments, east and west. Of course without the cooperation of the local farmers and the work of Coillte in clearing storm damage, this event could not have taken place. Helen and her Civil Defence team and Denny (who procured the marathon clock) and the radio backup group also deserve a special thank you. But the laurels must go to Rody, who not only completed his first full marathon, but together with his comrades, gave their all to provide a very special day for everyone. Next weeks walks: Easter Sunday will have three walks. The A group meet with Joe Brown at Galtee castle car park at 10am for a hike in the Blackrock valley. Ann O’Donnell will meet the B group at 10am at Mountain Road, Cahir for a forest path walk and Alec Lee will be at Woodies car park, Clonmel at 11am to take the C group around the Glenary area. Ray Coleman takes the Wednesday evening walk from Aherlow House Hotel on April 16th, starting at 7pm. The evening walks are now in full swing with three having already taken place. Weather conditions have been favourable for all three and numbers attending have been good. Wednesday evening walk on April 23rd, 2014, at the entrance to Aherlow Nature Park. Leader George Keogh. 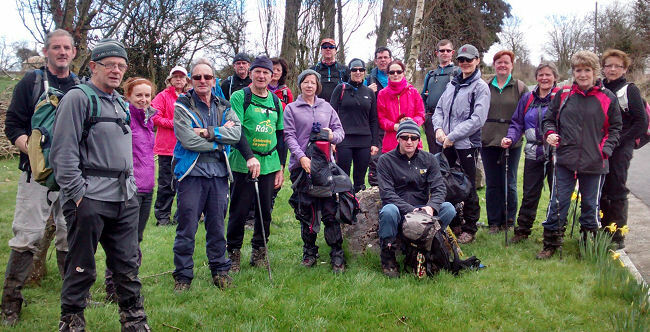 Easter weekend offered a variety of walks by different clubs and organizations and some of our members participated in The Mitchelstown Festival and the National Pilgrim Path walks in Kilcommon and St Declan's Way. At home, the club fielded three walks, with a C walk in Clonmel, facilitated by Alec Lee. 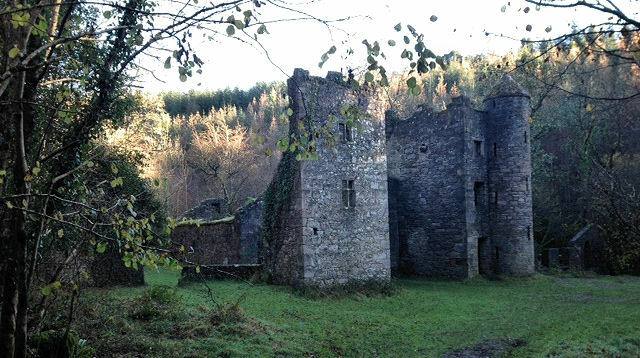 This novel 11km loop walk took in the Glenary Valley and Russelstown Wood, ending with a most interesting and informative talk by Ben Guiry on the history of Carey’s Castle and the Glenary area, accompanied by old photographs and documents. Much appreciated by all. 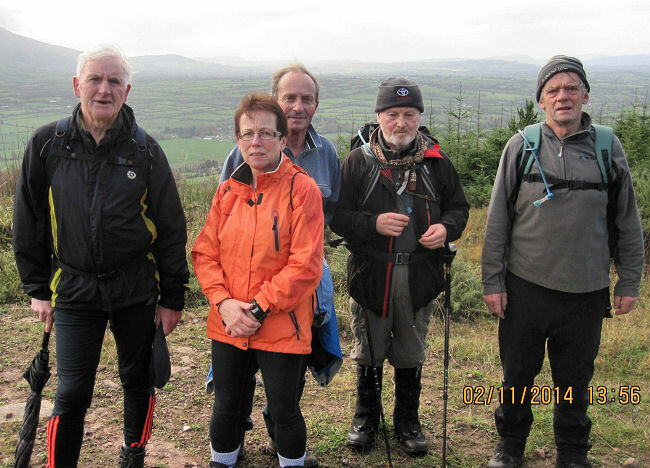 Anne O’Donnell was out with the B walkers on the hills overlooking Cahir and Joe Browne was with the A walkers in the Blackrock Valley. The Wednesday evening walks are now well under way with growing numbers turning out to enjoy the magic of those Spring evenings. Walks start at 7pm and full details are on the Schedule page. We thanks all the club members who are facilitating these walks. C walk in Russelstown Wood and the Glenary Valley, Easter Sunday, April 20th, 2014. Leader Alec Lee. 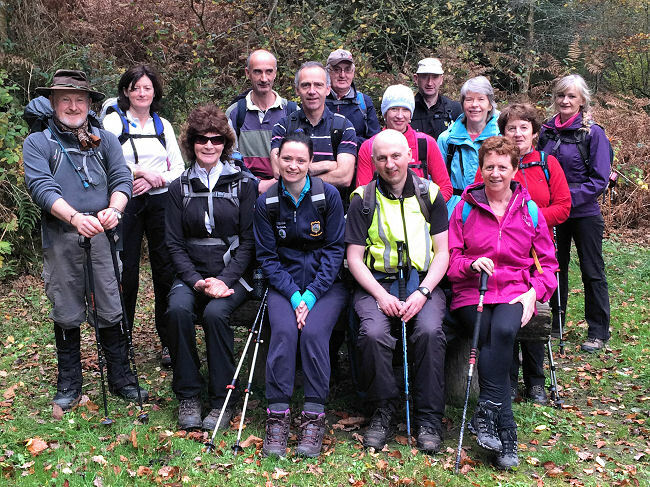 Club ranks were swelled by a visiting group of walkers from Meath who joined the ever popular C walkers on Sunday last for a 3hr traverse of Slievenamuck, from Christ the King to Bansha Woods and back. This was a challenging C walk with over 40 people, but George accommodated all, giving the more energetic walkers their head with Danny, while facilitating a more gentle pace for others. Weather conditions were very favourable, with sunshine showing off the pale sap greens of the spring foliage, the yellow gorse and the shy unfurling ferns. But an unexpected shower towards the end saw some stripped down participants scurry for shelter and reminded all that we can never take nature for granted! An exhilarating day out with thanks to George and helpers. 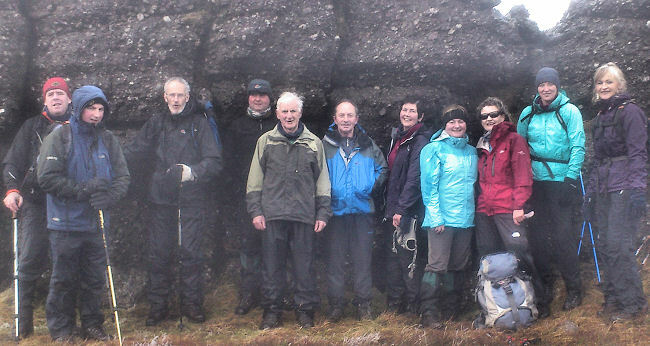 Roger Lonergan and 12 B walkers had a perfect four hour climb of Galtymor which they ascended from Clydagh Bridge. On the way up, a surprise birthday announcement was made on the Grassy Knoll by Dr Joe who is certainly not ready to hang his boots up yet! Happy returns Joe from all of us. Roger would like to thank Pat Donovan for his help on the day. 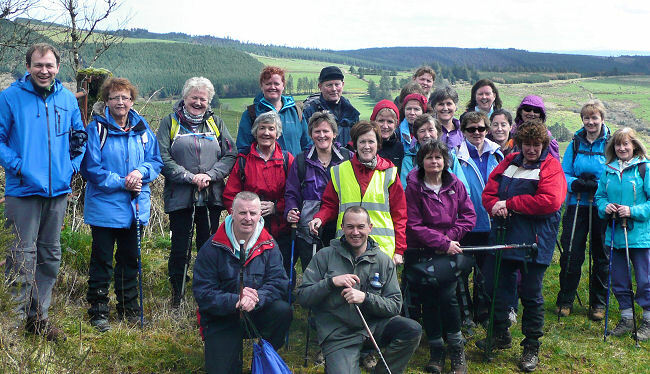 The A group were out in the Knockmealdowns with Pat Ryan. 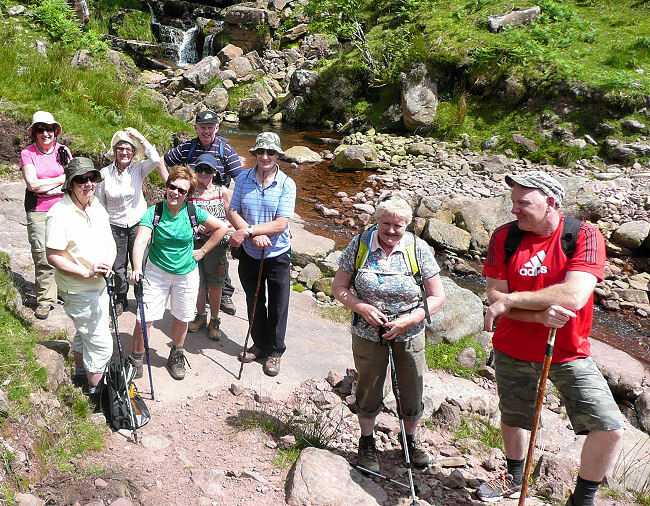 There are no club walks next week as there are two walking festivals nearby, The Ballyhoura International Walking Festival all weekend and the Knockmealdowns Crossing, organized by the Peaks Mountaineering Club on Saturday. Next Wednesday evenings’ walk, May Day Eve, combines a visit to the Apple Farm in Cahir with a tour of the surrounding area. For all walks please see the schedule page. A special club meeting will take place on 8th May at 8pm at the Excel, Tipperary town, to plan for the Aherlow Festival and the Galtee Challenge. Please come along, get involved, we need all hands on board! Wednesday evening walk to Darby's Bed from Galbally, May 7th, 2014. Leader Mary Ryan. Thanks to Tom Lyons for taking the A walk on Sunday last when a group of 4 took on the Galtee Horseshoe in good dry conditions for walking. 17 people covered 17 kilometres on Goretti Campbell's walk with a difference along the banks of the Shannon River and through Medieval Limerick. Starting from the Univeresity, Goretti's route began on the riverside towpath and looped around Corbally and King's Island before arriving at the old heart of the city. Here the group passed several historic sites including Thomond Bridge, the Bishop's Palace, King John's Castle and St. Mary's Cathedral with Goretti having a few informative words to say on each. Canal and riverbank brought them back to the University again for a loop around the campus. Many stayed on afterwards for lunch in the University restaurant on the Clare side of the river. Thanks to Goretti for a fantastic day out, the great information on everything to be seen along the way and of course the sweets and cake. Next Weeks Walks: Sunday 18th May, There will be a combined A/B walk in the Galtees, starting from Clydagh Bridge at 10am. 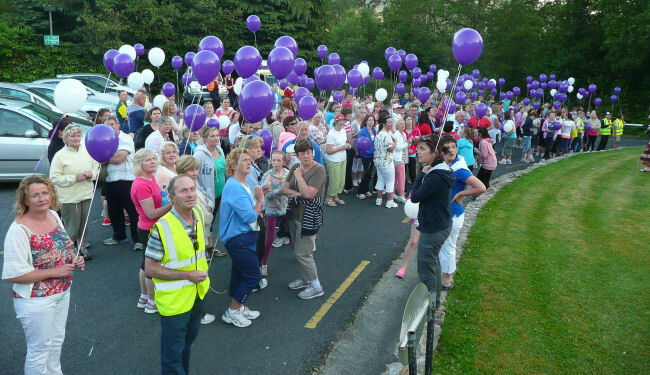 They will be joined by the Midleton Walking Club and will be led by Brendan Sheils. The C walk, led by Margaret Magner, will meet at Rock an Thorabh at 11am for a ridge walk to the Shrough Dolmen. Poor weather on Sunday last meant that numbers walking were low for the two club events. 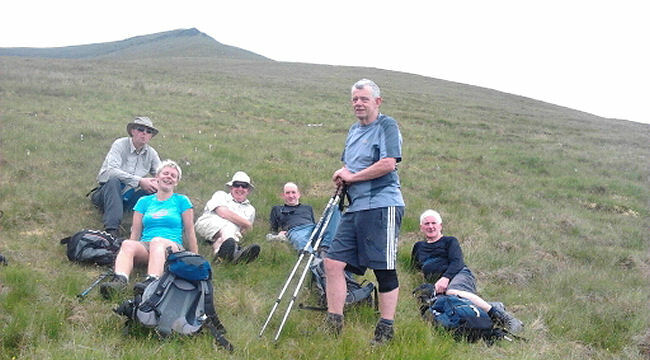 On the Galtees Brendan Sheils held a joint walk with the Midleton Walking Club combining both A and B grades on a 14 km trek. The 12 strong group started from Clydagh Bridge and took the old ice road to Lough Curra. From there they headed up the rock strewn ascent to Slievecushnabinnia, then followed the wall and onto Galtymore for lunch. The weather was certainly not the best throughout - heavy rain in the morning and misty conditions on the way up and down with views clearing only towards the end of the walk. After lunch the group headed back down via the stoney man cairn and the grassy knoll. Thanks to those who travelled from Midleton and thanks to Pat Donovan who assisted on the walk and of course thanks to Brendan. An enjoyable day despite the bad weather. Not far away in the Glen, undeterred by the occasional shower, a further 12 people enjoyed Margaret Magner’s C walk to the Shrough Dolmen starting from Rock an Thorabh car park and taking the track by the Mass Rock. Many thanks to Margaret. On Sunday next some members will travel to Kerry for a climb Of Carrauntoohil while closer to home Paddy will lead a walk to Lake Muskry, meeting in Rossadrehid at 11am. Along with everyone in Tipperary and surrounding areas the Galtee Walking Club extends its support to St Michael's FC in the FAI Junior Cup Final which takes place in the Aviva Stadium on Sunday May 25. 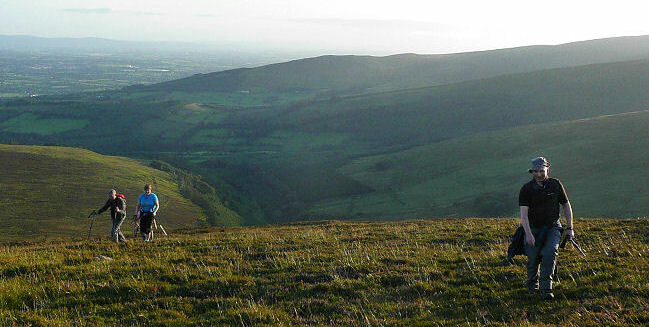 The Glen of Aherlow will host hundreds of walkers next weekend for the annual walking festival in the Galtees. Starting Saturday morning, 31st May, through to Monday, Aherlow Failte and the Galtee Walking Club are laying on nine walks over the three days. There are walks to suit all levels, from challenging climbs to family nature strolls. Entertainments are also laid on each evening including a barbeque on Saturday. Registration is at Lisvernane Village each day. Club members are needed to help out over the weekend. Just turn up and volunteer. Otherwise, the clubs walks have gone to schedule, though sometimes in uncertain weather conditions. Sunday saw 11 walkers take an adventure to Carrauntoohil led by Owen Ryan and organised by Pat Donovan. The walkers enjoyed good weather conditions however there was no visibility at the top. The return route took in the Heavenly Gates which proved a challenging experience but worth it in the end. Many thanks to Owen and Pat. Last Sunday's C walk, led by Paddy Bourke, had 14 people tempting the weather to take the riverside path up to Lake Muskry. We welcome the two Marys who made their first club walk to the lake. The Wednesday evening walks continue to draw large numbers of people and we thank all our facilitators for their efforts. Paddy's C walk to Lake Muskry on Sunday, May 25th, 2014. 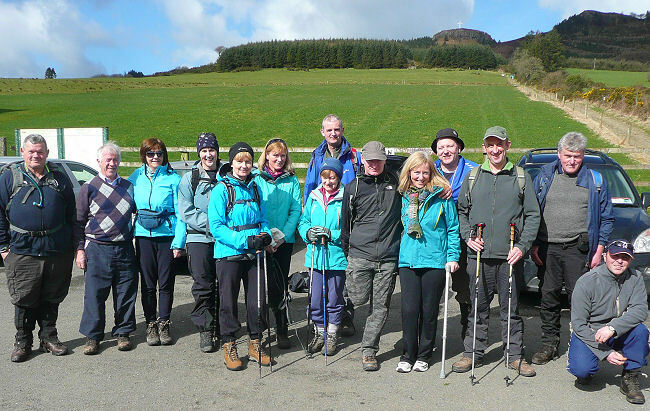 The three day walking festival in the Glen of Aherlow kept the Galtee Walking Club busy over the bank holiday weekend. Organized by Failte and fielded by the club, the festival was a resounding success with over 300 walkers of all ages from around the country and beyond, enjoying glorious weather conditions and wonderful clear views. 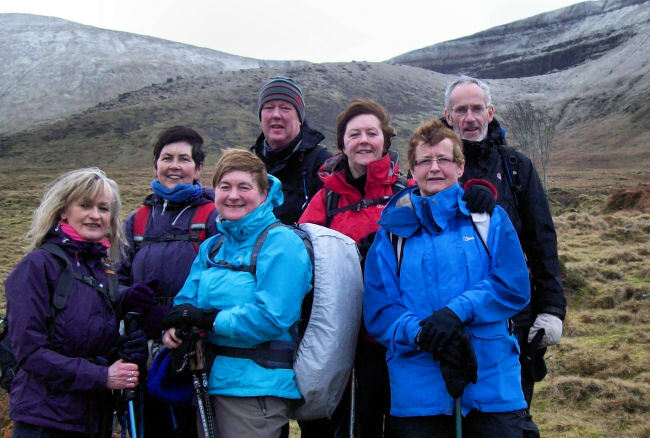 The club led three walks each day, with early starts for the more challenging A walks which started on Saturday with six hours and four peaks on the southern slopes of the Galtees. This was led by Thos O’Neill while Rody Tierney facilitated a south to north crossing of the peaks on Sunday. The four hour B hikes took in Cush mountain and lakes on Saturday, with leader, Tom Lyons, while Brendan Sheils facilitated the Sunday crossing from south to north. The more gentle C walks included a trip to Darby's Bed in Galbally on Saturday and was led by David Stapleton while Una Phelan’s Sunday walk took in the Dolmen Loop up from Lisvernane village. A nature walk for families through the lovely nature park at Christ the King rounded off the Sunday walks. Monday’s A and B walks headed to Lake Curra and Galtymore under the expert guidance of Mike Moroney. Our thanks to all who facilitated these walks. Helen Morrisey from Aherlow Failte and her team of volunteers deserve congratulations for all their effort with food and refreshments and for the interesting and welcoming base camp in Lisverinane. This was enlivened by an Impressive display of hillwalking gear by Mahers Sports from Cork. Many too took advantage of the evenings’ entertainment with barbeque, music and craic at Ballyglass hotel and at the Coach Road pub. This was a big hit and we thank Noel Brown who met all transport needs both day and night for walkers and revellers. Last but not least were the backup services provided by Hillwalking Radio and SE Mountain Rescue Association. Also out chatting to the walkers was Mary McDonnell from Grey Heron Media who was making a documentary for local radio and who got some enthusiastic plaudits from our happy walkers. Overall a great weekend and a welcome boost too for business in the glen. Well done to all participants. Sunshine with the odd shower was the order of the day for the club outings on Sunday last and we thank all three facilitators, Liz, Paddy and Vincent, for providing excellent walks. Liz Breen’s A walk took in the Red Hill area starting from Cappawhite Village while Paddy Bourke brought the B walkers to visit the waterfall on the Araglin River via the Avondhu and Knocknaclugga ways, starting from Bay Lough car park, the Vee. Not too far away, the large C group had a colourful 2.5 hour trek through the rhododendron flowers between Clogheen and the lake, in the company of Vincent Normoyle. Vinnie also arranged some food and refreshments in the village afterwards, which was enjoyed by both groups. The only club walk on Sunday next is a combined A and B outing in the company of visiting walkers from the Dromore Club in Co. Down. Danny Bailey will show them some of the best the Galtees have to offer on a horseshoe circuit starting from Clydagh Bridge at 10am. 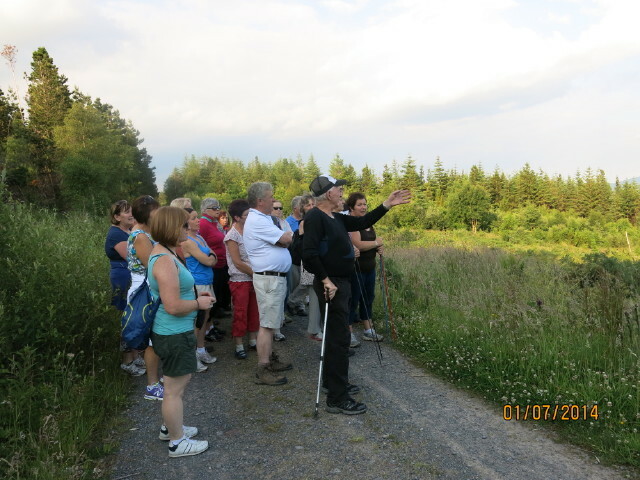 The Wednesday evening walks continue with a climb of Bane Hill led by Anne O’Donnell on June 11, meeting at Mountain Road, Cahir. 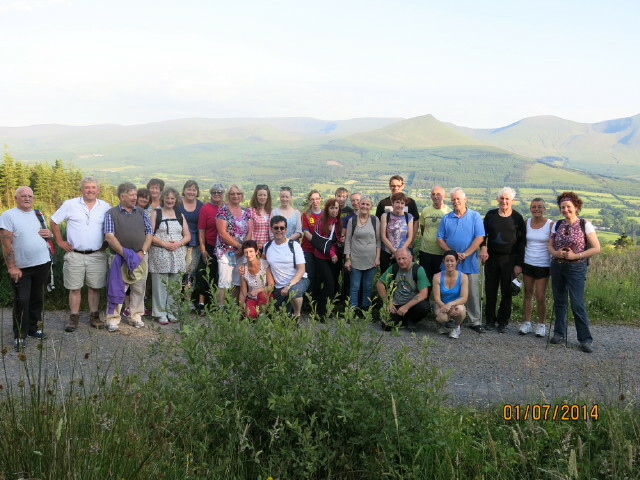 Those who took part in Breda Ryan's evening walk on the Dolmen Loop on Wednesday last were treated to spectacular views of the Galtees which have rarely been as clear. Vincent Normoyle's C walk through the rhododendrons at the Vee on Sunday, June 8th, 2014. 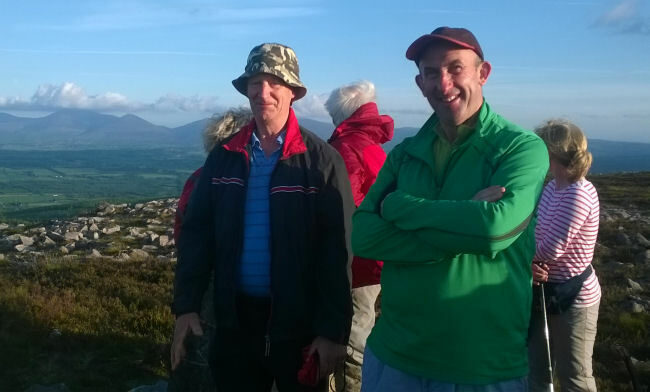 Paddy and Eddie on Bane Hill on Anne O'Donnell's evening walk, Wednesday, June 11th, 2014. Sunday last was a great day to be on the mountains and among the large numbers on the Galtees were 10 club members taking on the high horseshoe under the leadership of club president, Danny Bailey. The high ground was reached by way of the gully at the back of Lake Curra before following the wall to the highest point at Galtymore. Here the excellent visibility provided many photo opportunities before moving on to the second peak of the day, Galtybeag. The Geisha Steps brought them down over sparkling Lake Borheen while an ascent and descent of Cush finished off a wonderful 5 hour, 3 peak, 3 lake circuit. Thanks to Danny and also to Brendan for helping with navigation and a welcome to new walker, Tom O’Connor. On Sunday next, June 22, the A walk is in the Galtees with Breda Noonan meeting in Cush car park at 10am. Eddie McGrath’s B walk meets at Christ the King statue at 10:30am while the C walk is on the southern Galtee slopes, meeting in Kilbeheny at 11am. Evening walks continue with a climb of Temple Hill on Wednesday, June 18. Temple Hill - Wednesday evening walk 18/06/14. Leader Brendan Sheils. 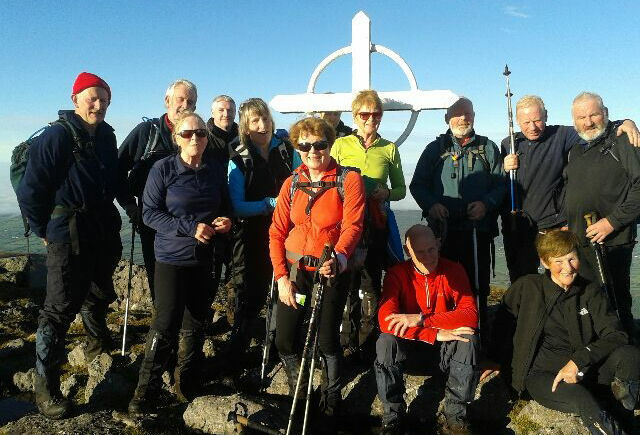 As the Sunday walks draw to a close for the Summer months it's time for the highlight of the Galtee Walking Club's year as the annual Galtee Challenge and Crossing takes place on Sunday next. This year marks the tenth running of the event which crosses the entire length of the mountain range and we salute the small number of club members for whom this will be their tenth time taking part. Congratulations to Owen, Pat and Breda Ryan for their dedication and commitment to the organisation of the event over the years and to everyone else whose contribution made the whole thing possible. All we can hope for now is good walking conditions on Sunday next as this year's participants take to the hills. On Sunday last Breda Noonan's 17.6km, 6 hour A walk on the Galtees took in Carrignabinnia, Galtymore, Galtybeg and finished with Cush. The sunshine and good company made the walk most enjoyable for all 7 participants. Also enjoying the good conditions were the 6 members on Eddie McGrath's 14.5km B walk from Christ the King statue. The highlight of this outing was a lovely visit to Aherlow Castle. The 10 people on the C walk from King’s Yard completed a loop taking in the Black Road, the waterfalls on the Attychraan river and the old Famine Village. Welcome to Bernie doing her first C walk with the club and thanks to all walk facilitators. The Wednesday evening walks continue throughout the summer. This week's walk starts from Clydagh Bridge when Paddy will lead a climb of Cush. Paddy is also taking a group up to Galtybeag on Sunday next to meet the Crossing and any member not doing the Challenge or Crossing is welcome to join him, meeting at Cush car park at 10am. 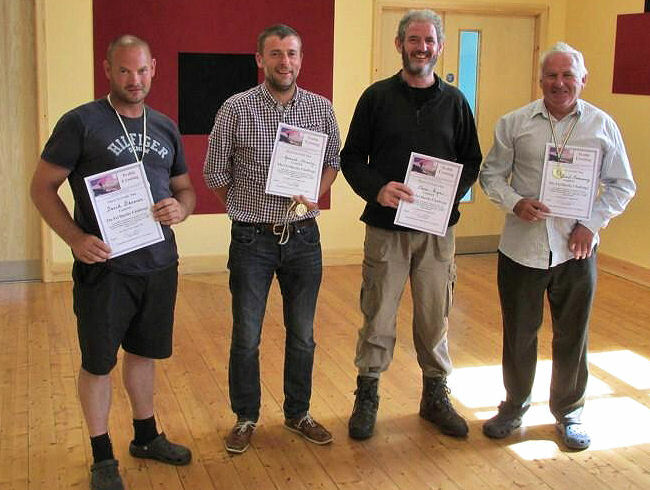 The last Sunday in June marked the tenth anniversary of the club’s biggest annual event, the Galtee Crossing/Challenge. The brain child of our late president, Bob Noonan and the Ryan brothers, the event has gone from strength to strength, with 120 participants this year taking on this 31km traverse of the entire Galtee range. Over 50 people opted for the self guided Challenge while the remainder were guided across by chairman, Owen and sweepers, Pat, Thos and Noel. The route bore west from Anglesborough, across all the major peaks, ending in Cahir. Organized meticulously by the Ryans and a band of core club members, no detail was overlooked, from early morning registration with Ann, Breda, Helen and Mary, to the three manned stations on the route and a party of helpers at the half way point to take people down should the case arise. The weather was splendid, with spectacular views but welcome cloud cover and cooling breezes too. Average time taken for this traverse was approximately eight hours with David Kiely streaking into Cahir in just five! But however long it took, all participants arrived safe and jubilant at journey’s end, where each received a medal, a certificate and a handy clip on towel from Breda. An evenings celebration with dinner was held afterwards at Kilcoran Lodge Hotel, where Breda’s 10th anniversary cake was cut and shared and a special presentation made to the four members for whom it was their 10th Crossing. Congratulations, Sheila, Thos, Pat and Owen. Something to aspire to for Sadie, who completed her first ever Crossing! Well done Sadie. A special thanks to the many unsung heroines/heroes who provided essential backup services for this event, from Denny and his radio crew, car porters, Mary, Paddy, water bearers, Una and Liz, and special support on the hills from President Danny, George, Tom and many other willing hands. Thank you all. Not least was Cahir Council who made a special effort to facilitate vital early morning toilets on the day. A day to be proud of for the club and for all who took the Challenge. Members of Oola parish choir, led by Gerry Ryan took a short walk along the Mass Rock trail with the Lowe family from Oola, in memory of Mary Lowe who died recently, RIP. Mary was a dear member of Oola choir and a former member of the Galtee Walking Club. Danny Bailey joined the special event at the invitation of the choir to represent the condolences of the walking club membership. It was a uniquely special occasion and the current sadness at the loss of Mary was temporarily lightened by the camaraderie of the group, and the beauty of the Glen of Aherlow on a glorious summer's evening. “Happiness is heading for the mountains with friends” Paddy’s weekend in Wicklow was surely that. The base for the weekend was Lynham’s Hotel in Laragh. Paddy organized a bus for the Saturday morning to take the group of 25 to the starting point on the Military Road. This road was constructed at the beginning of the 19th century to provide access for the British Army in the wake of the Irish 1798 Rebellion. This historic road now allows visitors to explore some of Wicklow’s fantastic natural beauty. Luggala Mountain (595m) was the first challenge of the day. Through a rocky and boggy terrain and an early morning fog we made for the top of the mountain and could just about make out Lough Tay down in the valley. The Guinness family and now the Vikings TV series are all connected with this area. We zigzagged down Luggala through a maze of fern and rambled on through a very inviting landscape of hills, valleys and forests until we reached Lough Dan. The atmosphere here was magical with the Lough’s white beach; some of the club members could not resist a dip. We continued walking through ruined dwellings from times past which blended into the surrounding landscape. After a 5 hour hike all were ready for a bus ride back to Laragh and a good rest. A small group decided to make their way back to Laragh by foot. Led by Proinsias De Paor, the group headed for Kanturk Mountain (524m). From there the group made their way across the ridge to Scarr Mountain (641m). This area is in the very heart of the Wicklow Mountains National Park and the views are breathtaking. A long descent through beautiful mixed terrain brought them back to Laragh. Thank you Proinsias for your help and knowledge of the area. On Sunday morning cars headed for Greystones railway station. The group of 27 made their way to Bray by train. Using the coastal path with its great views the group walked back to Greystones. A little café on the sea front in Greystones made for a perfect finish for a perfect weekend. Thank you Paddy for a great weekend. Approaching the top of Knockeenatoung on the Wednesday evening walk, August 7th, 2014. Leader Tom Lyons. The Sean Treacy Memorial Swimming Pool in Tipperary Town is a great amenity for the local area and deserves support. It has been suggested that Galtee Walking Club members could go there as a group on Tuesday evenings for the 8:30 to 9:45 session. Meet outside the pool with Danny Bailey at 8:30pm on any Tuesday evening. The cost of a session is €5.50. More information from Danny on 085 1316995. As the club begins to gear up for the Autumn calendar of walks, our Wednesday evening hikes draw to a close. The last walk was on Wednesday 27th in Bansha Woods, where Therese Roche led a lively round of these lovely local woodlands. An exceptionally good Summer provided for some glorious evening walks and we thank all who facilitated these hugely popular outings. We heard the cuckoo, admired the Rhodedendrons, dipped our toes in the mountain lakes and from time to time got caught by unexpected downpours. But the hay got well saved and Cork got bet! You cannot ask for more. Moving on, the new calendar of walks is now up on the website with a delayed start to our regular schedule to accommodate those hardy members who will be off on another leg of the Beara Breifne Way on the 6th & 7th of Sept. We salute and wish them well for this ongoing new initiative. Then from Sept 12th to 21st, our chairman, Owen Ryan and others will be climbing the County High Points of Ireland! Well done Owen but you must be back and fit to chair the club’s AGM on October 23rd! Scheduled walks start Sunday 14th Sept with all three grades out and about. Pat Ryan will lead the A walk, meeting at 10am at Kilcoran Lodge Hotel at 10am and Rita Hickey offers a forest path B walk of 4hrs, meeting at Ahelow House Hotel, also at 10am. Liz McNamara will lead a C walk through Scarrough Woods, meeting at 11am at Mountain Road car park in Cahir. So something for everyone and we look forward to a lively season of walks. New members are always most welcome. We would like to draw members attention to the fact that we desperately need some new scribes to maintain these reports. We are currently under pressure to get reports in for the paper deadlines and web maintenance must take priority. As things stand, there will be fewer reports except for the web and we invite members and walk leaders to submit their own account and/or photos of any walk or club event which they would like to share. This can be done by giving a more detailed account on the report page on the web or by email to David. Not only does this keep our pages alive but we also see it as an opportunity for members to take ownership of their club. For those who would like to get more actively involved with writing, please be in touch with David or Mo. We are happy to help out with editing where required. We look forward to hearing from you. 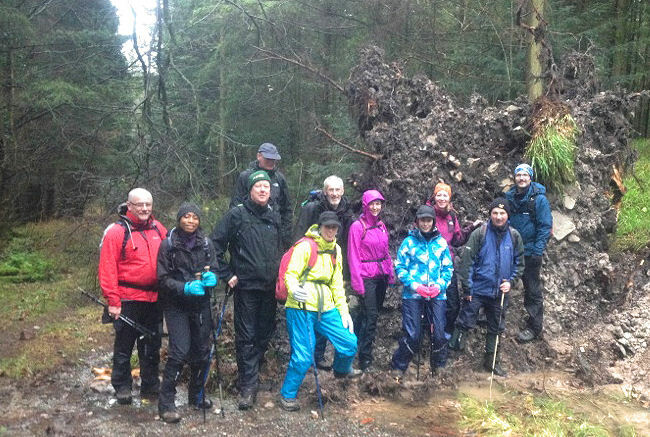 This year’s Galtee Walking Club adventure was to The Zillertal Alps in Austria. The Zillertal Alps are a mountain range of the Central Eastern Alps on the border of Austria and Italy. The range is named after the Zillertal (Ziller river valley) on its north. Mayrhofen in the Austrian state of Tyrol was our base. This Mecca for the outdoors is located approximately an hour from the Tyrolean capital city of Innsbruck and is situated near the Hintertux glacier, which, at 3250m above sea level, is above the snowline. The town sits between the Penken and the Ahorn mountains which provide ski runs in the winter and mountain biking, hiking and paragliding in the summer. The main lifts. Ahorn, Penken and Finkenberg give great access to high level walking. The town provides an excellent base for walkers - there are clearly marked walks suitable for everyone from beginners who can walk along the vast network of paths in the Ziller valley to experienced walkers (such as The Galtee Walking Club!) who can walk on the mountains. There are also excellent bus and rail services both along the valley and up into the mountains. A few of us found this out when we were too busy scoffing ice cream and had to get the last cable car to the next town. With typical Austrian efficiency we were able to get out of the cable car, walk 50 metres to the bus stop and get a bus 3 minutes later. This report covers Day 2. Hopefully some other adventurers will write about other days and post a few of the 100’s of photos taken. Pat Ryan led his band of budding Alpinists along the first stage of The Berlin High Trail from the town of Mayrhofen to the mountain lodge called Edel Hutte. In the second half of the 19th century, the scientific interest in making the Alps more accessible grew. Newly founded Alpine associations began to build shelters along with the necessary access paths to link them. These huts were located at very high elevations and often they exploited already existing pathways that had been used by hunters and smugglers. In the Zillertal Alps, the Berlin section of the German and Austrian Alpine Association was especially active and constructed many of the huts and trails in the area. As we made our way across the granite slabs of this trail, many of which had to be worked by hand, we could grasp the tough work the locals had to put into this project. The start of the trail was the top station of the Ahornbahn cablecar from Mayrhofen which dropped us at a very convenient 1955 meters. The Ahorn Cable car, which is the largest cable car in Austria (160 passengers) is situated at the southern end of the town. We wondered why it had tables. The size of the gondola means that it can also be used as a "floating cafe" when the weather is bad. From the station of the Ahornbahn we saw the path to Edelhutte but a few people spotted an extra peak with a large cross on it off to the side. Perhaps we were missing Galtymore, or wanted to work off some of the copious slices of Apple Strudel, so what could we do but climb it? The path climbed easily and we were soon well away from the crowds with a rapidly improving view across the valleys, thundering waterfalls and soaring mountain ridges of the area. Clear blue skies made visibility excellent. After the initial steep climb, the gradient eases for a while before a steeper final section up to the summit of the Filzenkogel (2227m) with its large cross marking the summit. Still mad for more hills, the crew continued southeast along the ridge to the next un-named summit (2230m). We retraced our steps to the cablecar and then on the path to Edelhutte (2238m). There was a lot of descending and then we started on a fairly steep zigzag path. A very relaxing lunch was had in the glorious sunshine of the Alps. Just one tip – if you order meatloaf it is actually a big slice of Spam. It was necessary to drink some beer to get over the shock. Well rested, we descended gradually through forests, roaring rivers and bell ringing cows back down to Mayrhofen and a juicy steak. This was just one of six days of nonstop fun on this holiday. 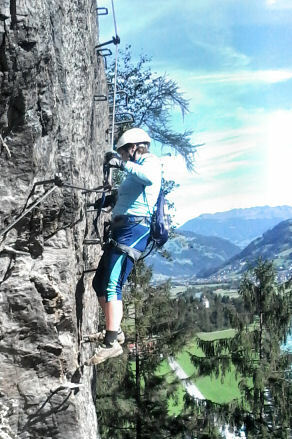 Activities included walking, coffee drinking, cycling, via ferrata, more coffee drinking, paragliding, dancing, sing songs, chilling out, bakery reconnaissance missions, a trip to Innsbruck sprinkled with a bit of shopping. Were we really away for only one week? A huge thank you to Breda and Pat Ryan for the superb job that they did in organising it. Another successful tranche of this historic walk has been completed by a group of 20 club members under the joint leadership of Breda and Mike. The Saturday trek started in the scenic village of Glengarriff. From here a short boat trip brought some of our members to the beautiful Garnish island. Others continued in the shadow of the Cabh Dudb mountain and over the Coomhola River, then into the valley of An Coinigeor, with views of the Shehy mountains to our right where we encountered a herd of Highland cattle. The days walk ended with weary legs as we descended to the glacier lake of Gougane Barra. We enjoyed our dinner in the views of this ancient religious setting. On Sunday morning we set out for Ballyvourney where some of us put our cupla focail to good use. Along this trail we came across many sites with standing stones and the old church where Donal Cam O’Sullivan and his famous troops camped and rested . We continued by the Bun Shidh Lann river which we crossed on two occasions and reached Ballyvourney in good time to see the match. The club's Sunday walks have started up again and we welcome all old and new members back to an exciting new schedule of walks. Three of our groups were out last Sunday to enjoy the exceptional weather conditions and the slow, quiet turning of the leaves. 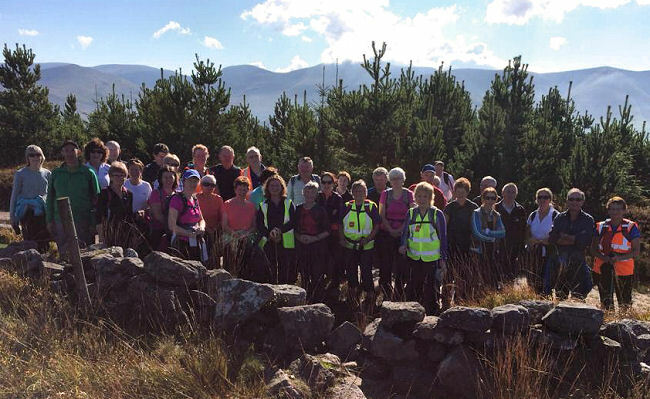 Spectacular panoramic views south to the Knockmealdowns and the Comeraghs were on display for the C walkers from the foothills of the Galtees around Raheen way. 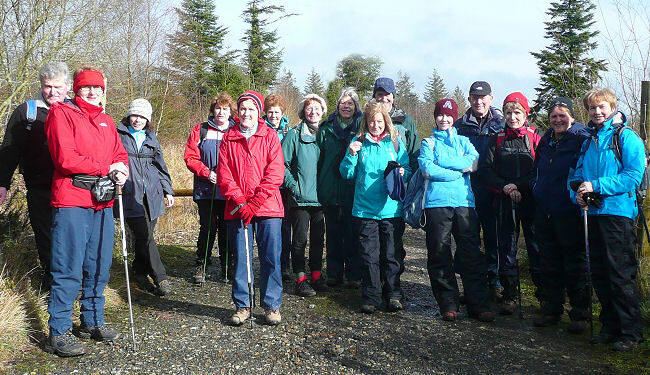 This was a leisurely circular walk, led by Liz McNamara, which ascended up from Mountain Road through the beautiful Scarrough Woods overlooking Cahir. It was a chance for many to get their legs back after the Summer and to renew their passion for the hills. The A walkers were further up in the Galtees with Pat Ryan, starting at Kilcoran Hotel, then up through forest track on to open mountain. They followed a track along the forest line to 541, (here Thomas had to squeeze water from his clothes after taking a dip in a bog hole) !!! Then on to 597 where they enjoyed a lunch break before heading on to 631. They then made their way to Farbreaga and Greenane 802 and continued down to the lodge at 382, where another break was had before heading back to Kilcoran Hotel. Due to poor visibility, navigation was essential, thanks to Pat and to Brendan for his navigation skills. 8 B walkers led by Danny set out at 10am from Aherlow house climbing the avenue and crossed the main road to head on the track towards the Rock an Thorabh. On a glorious September morning the walk continued through the forest trails stopping at the millenium stone for a photograph and briskly arrived at the Bansha woods picnic bench for a sociable lunch. Continuing onwards along the marathon route the group climbed up the laurels track and fast paced along the tracks towards Christ the king. The walk ended back at Aherlow house via the nature trail after 4hrs 20mins and covered 22kms. A great day was had by all and guests Annette from Sixmilebridge and Bosco from Tulla completed the walk by thanking all for a most enjoyable day. Please note that club membership for the coming year is now open for new members who can take advantage of this early bird offer to join the club before the new year begins in October. We invite all to attend our AGM on October 23rd at the Excel in Tipperary. See our website for all details. 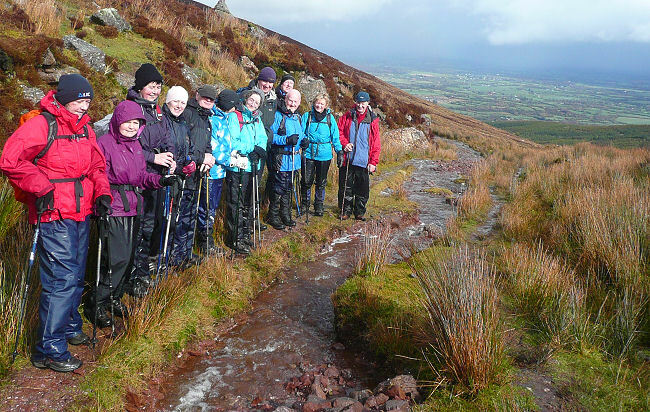 Next Weeks walks: Breda Noonan will meet the A walkers at 10am at Clydagh Bridge for a hike in the Galtees. For a gentle climb of Galtee Mor, the B group will meet with Paddy Bourke at 10am at Kings Yard. B walkers at the Millennium Stone on Sunday September 14th, 2014. Early morning fog on Sunday morning last gave way to beautiful sunny conditions for the club’s two walks an the Galtees. 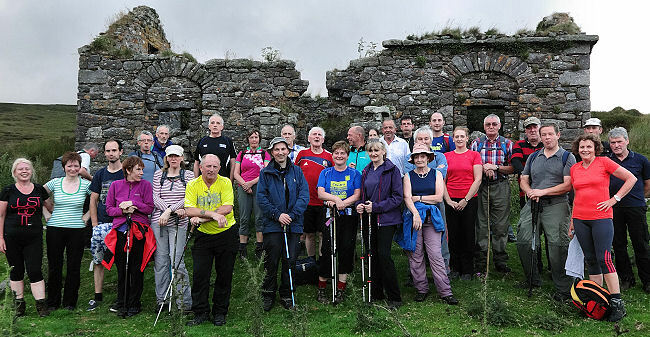 Pat Ryan’s A walk on the northern side of the mountain started from Clydagh Bridge while over on the southern side Paddy Bourke’s B walkers met at King’s Yard, a great facility for walkers in that area. Paddy welcomed a group of visiting walkers from Galway and the combined group of 33 headed for the wall via Knocknagalty and Knockduff. The warm sunny conditions allowed for a leisurely lunch break at the summit before descending the eastern side to meet the Black Road. Departing the track at the plane crash monument, the group descended to cross the Attychraan river and take the path through the famine village back to King’s Yard. 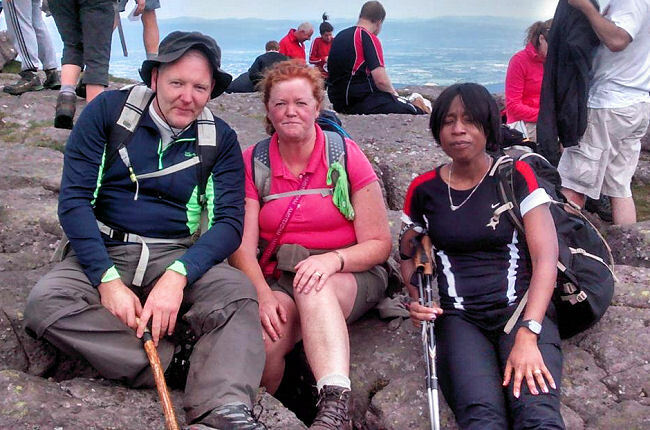 On Sunday next Owen Ryan meets the A walkers in Killarney at 10am for a climb of Carrauntoohil. Goretti Campbell visits two lakes in the Galtees with the B walkers meeting at Clydagh Bridge at 10am while at 11am in Clogheen, Denny O’Dwyer takes the C group on the Knocknaclugga Loop. There is also an environmental walk to Lake Curra on Saturday with Helen Lawless of Mountaineering Ireland. On Sunday last there were three club walks on three different mountain ranges. In the McGillicuddy reeks in Kerry Owen Ryan led a climb of Carrauntoohil from Cronin's Yard. The upward route was via the Hag's Glen and the Devil's Ladder to a misty and damp summit after good visibility at lower levels. The group of 7, three of whom were first-timers on the mountain, descended by the safer but longer Zig Zag track to welcome refreshments in the tea room at Cronin's. Thanks to Owen for getting everyone up and down safely and congratulations to him on the great achievement of climbing all the county high-points of Ireland in just ten days recently. 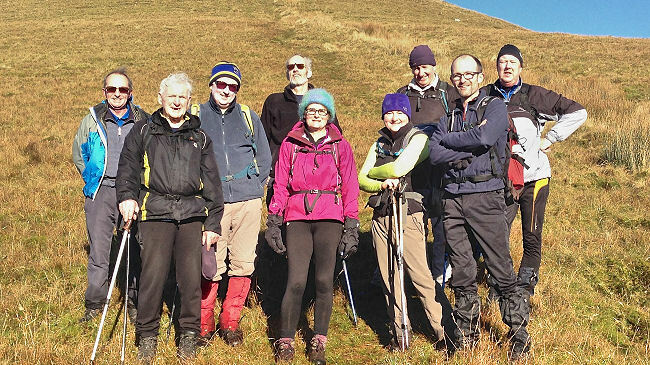 Fifteen C walkers, under the leadership of Denny O'Dwyer, set out on a new adventure to walk the Knockclugga Loop near Clogheen on the Knockmealdowns. This new walk brought them on mountain track, turf banks, wood and forestry track. Reaching 270 meters, they had some nice panoramic landscapes with occasional views of Dungarvan Harbour nestled between the curtains of cloud that teased them on and off as they rested for a while, with the banter of Kilkenny and Tipperary members replaying the All Ireland final. Denny being from Limerick tried to stay neutral but got annoyed when the witch doctors from Waterford sent a brief shower of rain down on top of them. Not to worry Denny said ‘’we’ll get our own back in the Munster Final next year’’. The trek took three hours over eight kilometres. A treat at the end was when they linked up with Andrew Fanning and his team from Cahir as they displayed their new Ford Fiesta in preparation for next week’s Tarmac Rally Championship. On behalf of the Club we wish Andrew every success. Thanks also to Goretti Campbell for a four and a half hour, 14km B walk in the Galtees, visiting two of the lakes from a start at Clydagh Bridge. Some of the group of 17 walkers were a little disappointed over the Tipperary defeat but all was soon forgotten once they hit the trail. They made their way up to the base of Cush and continued clockwise to Corrigeen rock. After a small break they trekked to the col between Cush and Galtybeg where it was a little tough under foot but they managed not to lose anyone. They climbed to Lake Borheen where they had a well deserved lunch break looking down on the lake, then traversed to Lake Diheen and from there made their way to the Galtee stile and forest track back to the cars. Well done Goretti and thanks also to Sadie for her help. On Sunday next the two club walks are on the Galtees. Ann Donohoe Takes the A walkers on the Galtee Horseshoe meeting at Clydagh Bridge at 10am and over at Rossadrehid Waterworks at the same time the B group will meet with Roger Lonergan for a four hour Lake Muskry High Loop. Owen Ryan and some of his A group on the summit of Carrauntoohil on Sunday September 28th, 2014. Conditions for walking on Sunday last were reasonably good but it was windy, with low cloud on high ground for the two club walks on the Galtees. "Six of us set off from Clydagh Bridge in cloudy but dry conditions, the sky showed promises of rain. We made our way up to lake Curra where we had our mini break. Surprisingly the weather was very pleasant. We then headed up to Galtee Mor where now we experienced fog and rain. This was disappointing as we had a visitor all the way from County Down who came especially to Tipperary to walk the Galtees. Being his first time on Galtee Mor he was happy to go back home with some photos taken at the cross in the fog. As we came down Galtee Beag the fog lifted and the rain stopped, however the wind began and it helped us up Cush. A good day was had by all walking, chatting and having the banter." Roger Lonergan's B walk was a 12km high level loop around Lake Muskry. Starting from the waterworks car park the group of 9 proceeded to the mountain gate going left and crossing the river before climbing to Farbeaga. Going on to Greenane and stopping for lunch at O'Loughlins Castle they descended by the side of the lake and joined the lake road back out to the car park. Early in the walk, walk leader Roger became ill and Brendan Shields and Joe Browne took over leadership of the walk. It is a great comfort to anyone leading a walk that such experienced people are available to take over at a moments notice and Roger would like to thank Brendan and Joe for their efforts. It was good to see new club member Tim McCarthy on the walk and Roger would like to say welcome to the club Tim and happy walking. On Sunday next, October 10, the A and B groups will combine under the leadership of Tom Lyons for a walk starting from Galtee Castle car park at 10am. Sadie Ryan will take the C walkers on the Dolmen Loop meeting in Lisvernane Village at 11am. 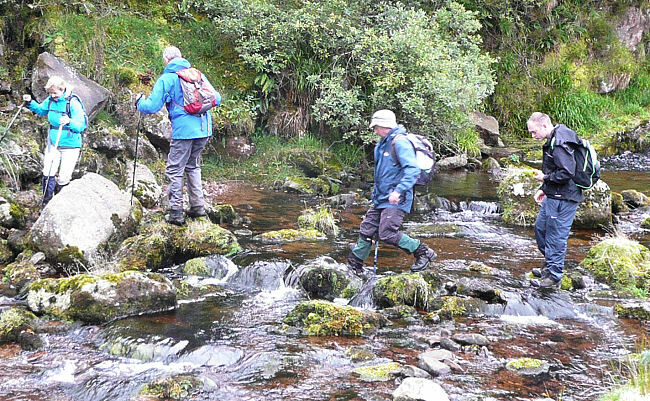 Crossing the Rossadrehid River on Roger Lonergan's B walk on Sunday October 5th, 2014. The summer-like weather of sunshine and clear blue skies lingered into mid-autumn making it a pleasure to be out on the hills for last Sunday’s two club walks. 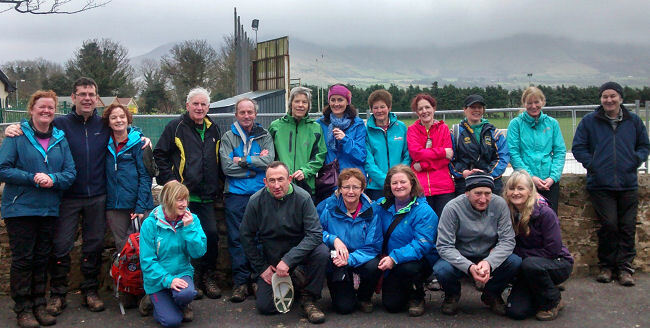 Tom Lyons took a combined A and B group of seven on a five hour, 17.5km trek in the Galtees. This is Tom's report on the walk. 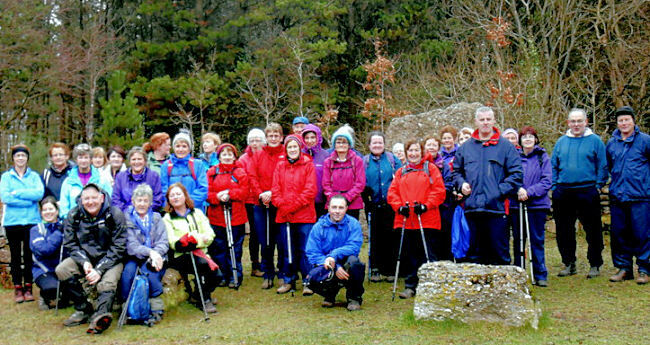 An excellent attendance of 38 people enjoyed Sadie Ryan’s C walk on the Dolmen Loop from Lisvernane Village. Sadie was joined by some of her colleagues from the Hillwalking Radio Group who took the opportunity to get in some practice with the radios, although it has to be said that the conversations did not always follow strict protocol. Thanks for a lovely walk to Sadie and Helen. Next Sunday’s A walk is a loop on the Galtees with Thos O’Neill, meeting at Ballydavid Hostel at 10am while the B walk is on the Comeraghs with David Stapleton, Meeting at Woodies, Clonmel, also at 10am. 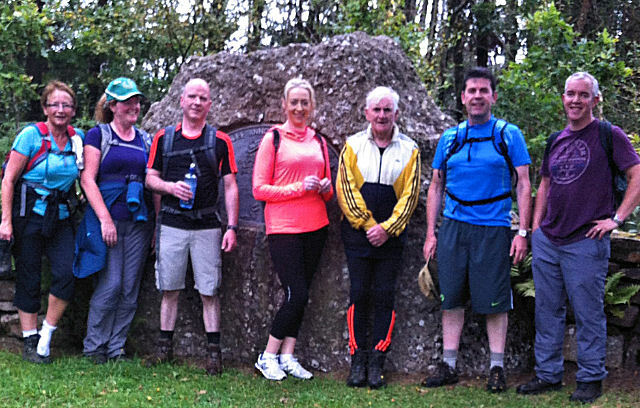 Group photo in the sunshine at the Dolmen on Sadie Ryan's C walk on Sunday October 12th, 2014. The Galtee Walking Club Annual General Meeting takes place in the Excel Centre on Thursday next, October 23, starting at 8pm. All members are welcome to come along and have their say on the running of the club. Two walks took place on Sunday last. Despite a yellow weather warning a group of seasoned and new walkers gathered at Ballydavid youth hostel for an A walk on the eastern slopes of the Galtees with leader Thos O'Neill. The group made their way to the mast admiring the autumnal foliage on the way and also took time to examine deer rutting sites. Then on to open mountain first visiting Sturakeen then 541. They lunched at Sliabhanard. From there on to the Bane and back to the hostel. Last February's storm damage was still evident on the tracks with lots of fallen trees to be avoided. The weather was very good with only occasional light rain. Overall a very enjoyable 18km walk. Thanks to Thos. David Stapleton’s B walk was in the Comeraghs near Clonmel. The 12.5km loop took in the Holy Year Cross, Long Hill, the Glenary River and Carey’s Castle. On Sunday next, October 26, Danny Bailey leads an ‘A’ loop walk from Rock an Thorabh car park, meeting at 10am. Down the road at Christ the King statue Brendan Sheils meets the B walkers, also at 10am, for a 4 hour walk. 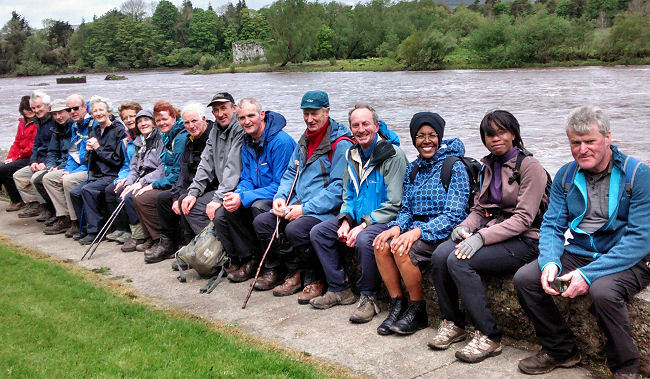 Breda Delahunty will take the C group on the Millennium Trail in Glengarra Woods, meeting at 11am. Thanks to Danny Bailey, Brendan Sheils and Breda Delahunty for providing the three club walks in typical autumnal conditions on Sunday last. Danny’s A walk and Brendan’s B walk took place in close proximity on Slievenamuck. Led by Danny, a fast paced A walk took off along the 21km marathon route from Rock an Thorabh carpark down to Aherlow House and along the nature park trail via Christ the King to Kilshane with an energised group on a unseasonably mild Sunday morning. Thanks to Gerry for the photo who had to divert for a Camino de Santiago Mass in Limerick and the group continued fully energised after a short lunch break at the Kilshane carpark and arrived back to base after a fast paced A walk expedition. Brendan's 15 B walkers started from Christ the King and completed a four hour loop taking in the Ballagh Road, Bansha Woods car park for a leisurely lunch and the Millennium Stone for some photos. Then it was on to the Steeple, Rock an Thorabh, out to the road and through the Nature Park back to the cars. 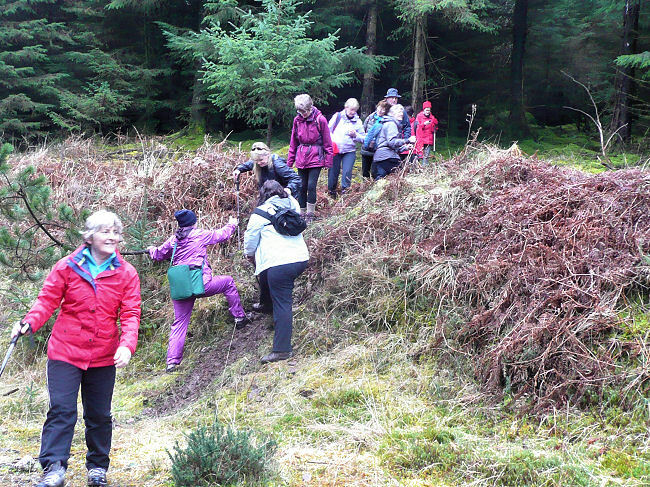 In Glengarra Woods on the southern slopes of the Galtees, Breda’s 18 strong C group followed the Millennium Trail through the woods enjoying the colours of the season including the red berried holly in more abundance than has been seen for many a year. It was great to see Mary and Peig back walking again after being out of action for some time. On Sunday next, November 2, Rody Tierney continues to follow the Marathon route on an A walk starting from Rock an Thorabh car park at 10am while Anne O’Donnell’s B group visits the Blackrock Valley, meeting in Galtee Castle car park at 10am. 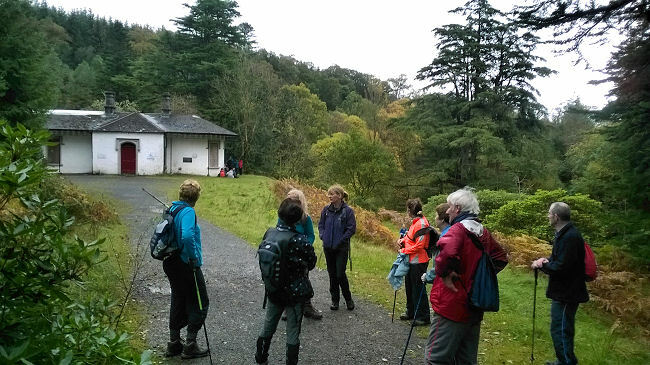 C walkers at Glengarra Hostel on Breda Delahunty's Millennium Trail walk on Sunday, October 26th, 2014. Danny Bailey's A walk from Rock an Thorabh car park on Sunday, October 26th, 2014. The two club walks on Sunday last took place in beautiful autumnal conditions. Rody Tierney’s A walk followed the western half of the Marathon course from Rock an Thorabh car park. This is Rody's report. "On the first Sunday of November a group of hardy A walkers went on a westerly trek along the Lisvarrinane side of Slievenamuck. The splendid weather conditions could be mistaken for mid summer - the autumnal foliage being the only giveaway. A lot of the conversation today was in our native tongue – thanks to the fluency of two new members from the rebel county. Failte Paidrigin agus Tomas! The magnificent Galtees were in full view on the outward and return journey. Wildlife encounters included a pair of herons rising from the Aherlow River. On the opposite bank was a rare sighting of a flock of goldfinches feeding on ragwort seed. This half marathon walk was completed in around four hours - pace set by Danny. Good company and weather made this a memorable day. I was pleased to observe the recent upgrading of the forest track close to the dolmen. This should improve conditions for next year’s marathon on March 29 (Palm Sunday)." Anne O’Donnell’s B walkers were in the Blackrock and Glounreagh valleys on the southern side of the Galtees and this is Anne's report. "After leaving Galtee Castle carpark we headed in the direction of Blackrock/Pigeonrock Valley. On reaching the point where the 2 rivers Blackrock & Pigeonrock meet we picked up the wall and followed this out into the valley. Lunchtime was had nested near some towering rocks with views of Lyracappul, Bengower & Galteemor peeping out in the distance. We made our way down the valley crossing the Blackrock river. We then took the zig zag track up to the saddle down to the Glounreagh valley, crossing the new bridge back through Kings yard to the cars. The weather was kind & we had fantastic views all day. Thanks to Brendan for his help." On Sunday next, November 9, A walkers meet at Glengarra Woods car park at 10am with Tom Lyons, Sheila Lenihan takes the B walkers up Temple Hill, meeting in Anglesboro Village at 10am and Cecelia O'Heney leads the C group from the Lady Gregory Pub, Kilmoyler, at 11am. All members are reminded that membership fees for the coming year are now due to be paid. 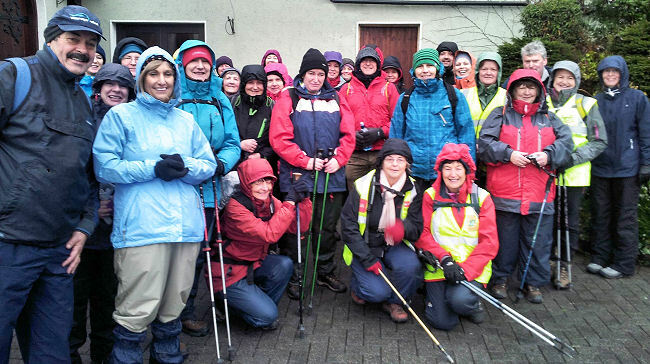 The C walk on Sunday last was the best attended of the three club outings with 24 people, led by Cecelia O’Heney, completing a three hour loop through forest tracks on the Galtee slopes between Cahir and the starting point at the Lady Gregory pub. Red berried holly and the autumn leaves made this a colourful event, so many thanks to Cecelia for this enjoyable day out. Ann Donohoe stood in for Shelia to take the B group up the steep slopes of Temple Hill. This is Ann's report. "The B walk left Anglesboro village in mild dry weather conditions. The 9 of us enjoyed this nice weather and nice views until we nearly reached Temple hill. Here we had fog and mist. The weather here did not interfere with us enjoying our lunch and a friendly chat to other walkers who were also dining out. On our way down the fog and mist lifted giving us again nice weather and off came our coats. We arrived back in Anglesboro having had 4 hours of good walking, good company and plenty of chat." Thanks also to Tom Lyons for the A walk on the southern side of the Galtees. 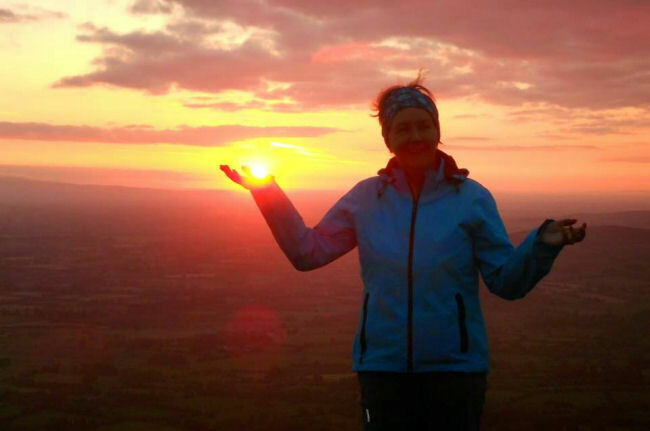 We take a break from the Galtees next Sunday when Liz Breen leads an A walk on Red Hill, meeting at Cappawhite Church at 10am and Breda Ryan does a 4 hour Lisvernane Loop, meeting in the village, also at 10am. If anyone is on the Galtees over the next few days please keep a look out for a missing springer spaniel dog and phone 087 1215016 if you see him. There’s a busy weekend ahead for the Galtee Walking Club with events on both Saturday and Sunday. On Saturday members will take part in a litter clean-up in the Aherlow area meeting at the Coach Road Inn at 10am. It is hoped that as many people as possible will attend to spread the workload and make things easier for everyone. On the same day Mountain Meitheal are finishing their work on the Curra Track and they are also looking for volunteers. On the following day, Sunday 23rd, there is a full schedule of club walks with Gerard Sheehy taking the A walk on the Comeraghs from Carey’s Castle at 10am, Pat Donovan taking the B walk on the Galtees from Clydagh Bridge at 10am and Denny O’Dwyer meeting the C group in Ballylanders at 11am. We are grateful to Liz Breen and Breda Ryan for the two walks on Sunday last. Liz was on her home ground near Cappawhite, taking in Red Hill north of the town. Breda’s B walk was on Slievenamuck, starting from Lisvernane. The group of 24 completed an extended Dolmen Loop, travelling as far as the Rock an Thorabh car park and covering over 20km in 4.5 hours. The weather was foggy to start but the sun came out for the second half of the walk making it feel positively warm. Only for the low sun, the golden leaves and the red holly berries it could have been summer. At the lunch break on the farthest point of the walk there was a pleasant surprise when Breda produced home made buns and slices of apple tart for everyone. The extra calories were well walked off by the time the group reached Lisvernane again. 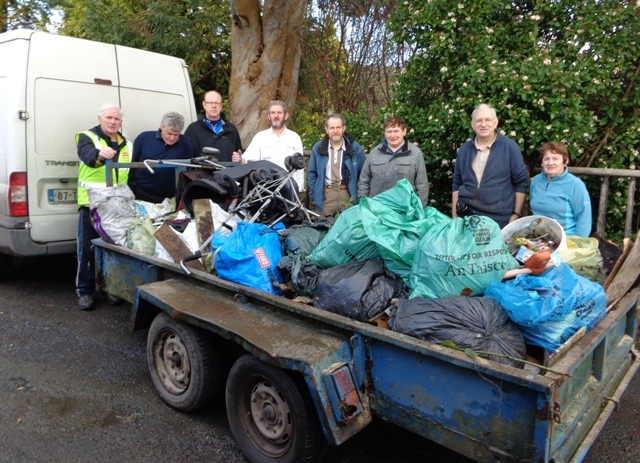 A clean-up of litter on the Ballagh Road took place on Saturday, November 22nd. Nine club members took part and in just two hours gathered two trailer loads of rubbish from the forest entrances and the roadside. In such a short time it was not possible to gather everything but at least now there is a much better appearance on the place. Hopefully it will stay that way and the dumpers will cop on and dispose of their refuse by legitimate means. Thanks to all who took part in the clean-up and thanks to Helen for the tea and biscuits afterwards. Club members who took part in the clean-up on the Ballagh Road. Missing from the photo is Liz Breen who also took part. Last Sunday was just a perfect day to be outdoors with clear blue skies and sunshine all the way for our three club walks. 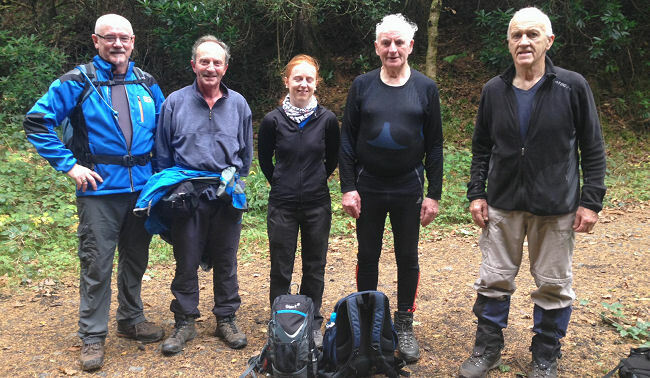 Gerard Sheehy’s A walk was in the Comeraghs and this is Gerard's report. You’d be forgiven for thinking that you’d died and went to heaven on Sunday morning. Such was the beauty of the day. A low level walk was planned, so the summiteers would have been disappointed. Carey's Castle is a good place to start a walk, as there is a nice walk-in on forest track to help with the warming up before you exit on to the open Comeragh mountains. The Glenary River is within hearing distance for the first 3.5km. It has a calming effect on walkers who need a bit of free relaxation therapy. Next, it was up and over the col to the SW of Lachtnafrankee and down towards the old ‘village’ of Glendalougha. The paths that were taken were those that the original inhabitants would have taken to go to Clonmel. Streams abounded, but nothing that a skip and a jump couldn’t remedy. Next it was East to Knocknaree and Knockatedaun to pick up a not so frequently used track. A maze of track, field and road in that area brings you down behind Hanora’s Cottage and the Nire Church. You follow the Glennanore stream, from there, and then head towards Moanyarah and ‘The Chimneys’, crossing at a multiple tributary junction. It was only recently that I enquired as to the history of said ‘Chimneys’. During the War the army used to cut turf up here so that they could keep the hospital in Clonmel open. Nissan huts were erected to billet the soldiers to ‘protect’ the turf and the ‘chimneys’ are what’s left of those. The final leg of the journey brings you to Lachtnafrankee and down it’s Western spur to pick up the track that follows the Northern side of the Glenary river and back to the car park via Carey’s Castle. Built in the 1800s by a local family. It has an ice-house on its grounds and has a mixed bag of architecture in its construction - Romanesque and Gothic arches, Celtic round tower and Norman keep. The walk covered a distance of 26.2km with a height gain of 981m. Pat Donovan's B walk was a loop to Lake Diheen and Cush in almost 4 hours in perfect weather. This is Pat's report. The B walk left Clydagh Bridge in perfect sunny conditions for a mid range climb to Lake Diheen via the Galtee Stile. After a short stop its was on to Cush Mountain for the 10 walkers, descending back to Clydagh Bridge in two groups. Thanks to all who took part. This is Denny O'Dwyer's report on his 8km C walk. 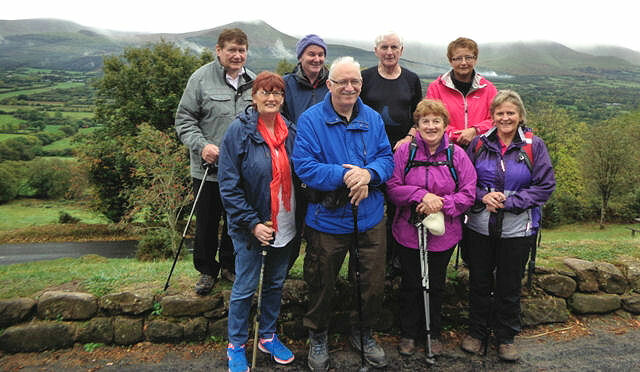 Denny O’Dwyer was delighted with a total of thirty four walkers who turned out for his C Walk to Sliabh Ri, Glenbrohane this Sunday. The Group met up in Ballylanders where there was a brief historical talk on the attack and burning of the R.I.C barracks on the 24th April 1920. Another famous house in the village was the former homestead of a great athlete and visionary Frank B. Dineen who mortgaged the family property to purchase a field at Jones Road Dublin better known today as Croke Park. We had a beautiful laid back relaxed walk to the top of Sliabh Ri taking in views from three counties. For being very well behaved we got an extra treat with a visit to the Lazy Dog shooting range where we had tea, coffee and biscuits. Thanks to Mary and Ray Sampson for providing refreshments and a tour of the centre. Someone left a purse behind at the range so if you ring 086-0888145 it will be returned to the owner. Thanks to all three leaders for making it a memorable day and thanks also to those club members who took part in the litter clean-up in the Glen on Saturday 22nd. The A walk next Sunday meets with Mike Moroney at Cush car park at 10am and Thos O'Neil’s B walk meets at the Lady Gregory also at 10. On Saturday evening there is a fundraising walk from Clonmel for Mountain Rescue, which deserves support. There was a lot of support from The Galtee Walking Club for South East Mountain Rescue’s “Walk The Long Way Round” inaugural walk. Held on Saturday Nov 29th, it was an imaginative concept to run a 15km walk/run in the Comeraghs in the dark. The organisation was flawless in every way, with lots of choices for pace and whether you wanted to do it in your own group, or as part of a led group. We were blessed with the weather; dry, clear and mild for the time of year. Starting in Clonmel, at the new SEMRA base in the fire station in Haywood Road, we went downhill to the glass bridge and then along the Dungarvan road. There were a few bemused looks from some of the Saturday night pub goers! We took a left up a little byroad to bring us on to Kilmacomma Cross where we entered the wood and contoured along the side of Cannon Hill. We then dropped down to the East Munster way track, which we followed into Glenabby car park and on to Russellstown wood. We followed the bank of the river to the concrete bridge, and then proceeded uphill beside the Rhododendron tunnel to the col, followed by a traverse over to the Holy Year Cross. The view from the Cross was breath-taking. Clonmel was lit up and laid out in a magnificent carpet of light beneath our feet. We dropped downhill to the East Munster track again and followed this back to the town where we crossed the glass bridge again and retraced our steps back to the base for refreshments. People started to speed up when they knew that tea, soup and cakes were on offer. The route was extremely well marked and lit. In fact the lights gave the impression that you were entering a sort of magical fairy glen. It gave us an appreciation of mountain rescue volunteers going out at night (even if they don't have lights to guide them). Having walked these mountains many times, it gave a different perspective to see the lights of Clonmel from the Holy Year and the mountains looming in the half light. The event at the finish had a great buzz and the SEMRA mugs, (now a prized possession), and miniatures were a nice touch. Approximately 300 people took part from all over and many hoped it would be a yearly event which speaks for itself. As walkers, we adore the wilderness of the Irish mountains. We get so much joy from the time we spend there. But there are also risks. Unlike other parts of Europe for example, we do not have many clearly defined tracks. Walking on indistinct, rough ground means that anyone can have an injury or get lost. One day you, or one of your friends or family, may owe your lives to the brave women and men of South East Mountain Rescue. They give their time as volunteers to keep us safe. Taking part in the “Walk The Long Way Round” event was a fun way to support them. We owe them a huge thank you for the time and effort that they put in to assist those who get into difficulty on the hills. So let’s put next years walk (I hope) on the list of “Things I Must Do in 2015”. Sunday was an amazing day to be in the mountains with clear blue skies overhead and fog covered valleys below. Both club walks were in the Galtees and this is Mike Moroney's report of his A walk. The A walk commenced from Cush car park in beautiful weather taking in Knockmoyle and Cush at a lively pace. It was then onto Borheen Lough and along the valley on the 450 contour line rising gradually in the direction of the col between Knockastakeen and spot height 786, then turning back traversing the Balcony on the 600 to 650 contour lines. After tea break we climbed Galtybeg, Galtymore, Slievecushnabinna and back to the cars by the stone man having climbed 1190 meters and 17Km. Thanks to all 14 walkers for a great day’s walk. Thos O’Neill had 21 B walkers on his 14 km loop from the Lady Gregory. They climbed to Bane Hill above Cahir where the fantastic views of the other local mountain ranges rising from the fog filled valleys were much admired and photographed. 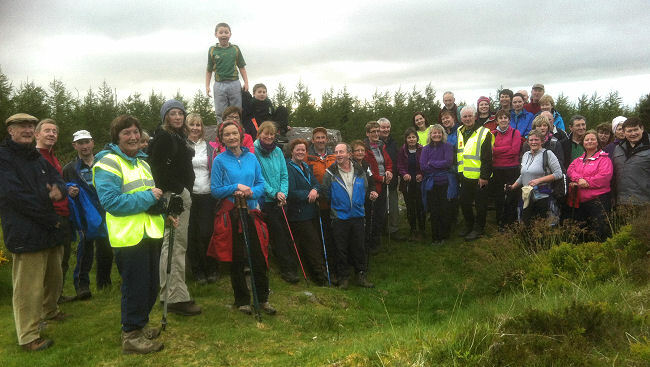 On the way up the group met with fellow walkers from the visiting Bishopstown club and climbed to the top with them. Added bonuses on the return journey were visits to the Toureen waterfall and St. Pecaun’s Well. 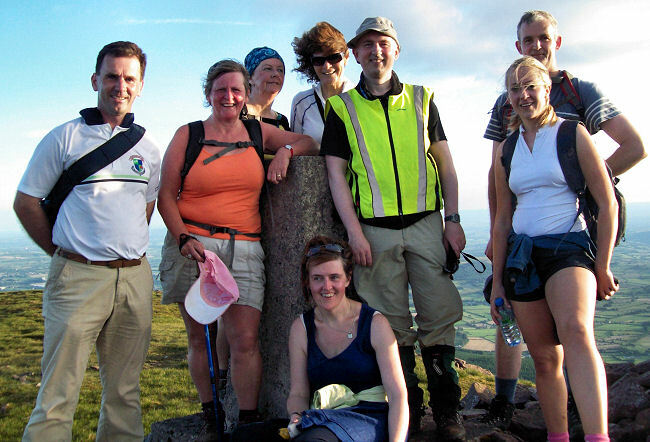 At least ten club members took part in the Mountain Rescue fundraising nigh walk from Clonmel on Saturday night. It was a very successful event, superbly organised and very well attended with over 250 people participating. The A walk on Sunday next is a joint outing with the Ballyhoura Bears club. Meeting at Cush car park at 10am, Owen Ryan and Pat Lombard have a 5-hour Galtee walk planned. George Keogh’s B walkers will meet nearby at Clydagh Bridge for a 4 hour Cush loop, also at 10am. At 11am in Bansha Woods car park the C walkers will gather for Amelia Ryan’s trip to the statue of Christ the King in the Glen. Mike Moroney's A walk on the Cush Horseshoe via Balcony on Sunday, November 30th, 2014. 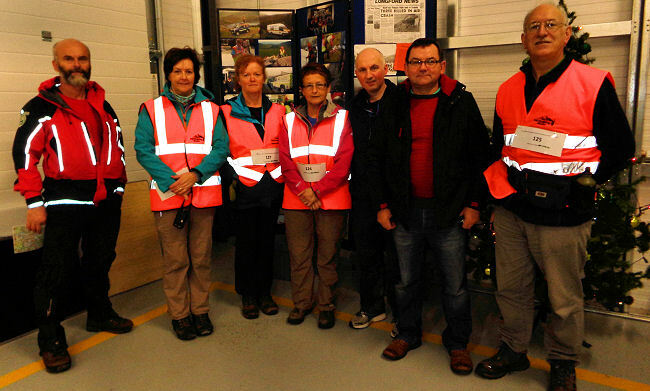 Members of the Galtee Walking Club and Hillwalking Radio Group before the fundraising walk for Mountain Rescue in Clonmel on Saturday, November 29th, 2014. Twenty-two members enjoyed the good food and company at the Club Christmas Party in Ballyglass House Hotel on Saturday night last. Thanks to the hotel for the hospitality and thanks also to Breda Noonan and Mike Moroney for organising the event. Despite the late night, many present were out again on Sunday morning for the three club walks. The A walk was a joint outing with the Ballyhoura Bears led by Owen Ryan and Pat Lombard. The group of 22 spent 5 hours on the Galtees starting with a climb of Cush and a visit to Lake Borheen before following the contour lines east to the shelf above Lake Muskry and back by Knockastackeen. George Keogh’s B group started out in the company of the A walkers but parted ways at the base of Galtybeg before a trip to the lake. Amelia Ryan had 30 on her C walk in Bansha Woods, visiting the Millenniun Stone after coming through some of the wilder and seldom visited parts of the forest. On Sunday next the A walk meets at Cush Car Park at 9:30am with leader Willie Cummins. Helen Gleeson’s B group meets at Clydagh Bridge at 10am and David Stapleton’s C walkers meet at Woodie’s, Clonmel at 11am. Walking through Bansha Woods on Amelia Ryan's C walk on Sunday, December 7th, 2014. Helen Gleeson’s choice of route for her B walkers was a 17km open ground and forest track loop on the northern slopes of Cush Mountain, travelling almost as far as the Waterworks at Rossadrehid from the start at Clydagh Bridge. On the return journey along the Cush top track, given the time of year, some time was taken to collect some lovely berried holly. Despite this diversion the walk was completed in 4 hours at a good pace. Thanks to all for a great day's walking and well done to both Helen and Willie. Over in Clonmel the C walkers also managed to collect some red berried Christmas decorations along the way and survived the occasional watery challenge to complete David Stapleton’s circuit of the Holy Year Cross and the Glenary Valley which started and ended at Carey's Castle car park..
On Sunday next Eddie McGrath leads the only club outing, which is a B walk from Christ The King Statue, starting at 10am. Later that evening, at 7:30pm, there is a winter solstice night walk to Slievereagh, meeting at Glenbrohane Church. To round off the year there will be the traditional 2.5 hour walk on Christmas Morning with Ray Coleman, meeting at Christ The King Statue at 10am and a longer 4 hour walk on St. Stephen’s Day with Danny Bailey from Bansha Woods car park, meeting at 11:30am. 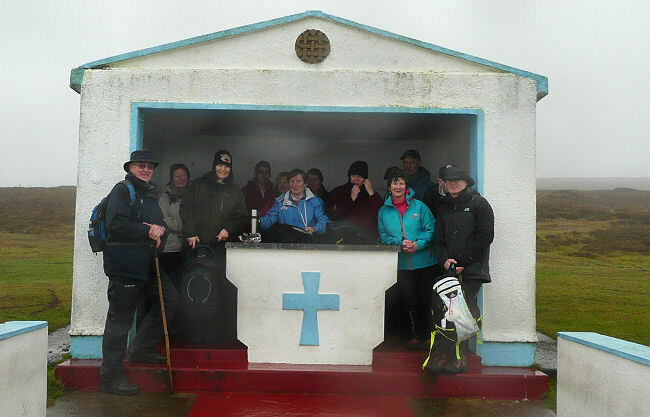 Taking shelter from the mist at the Holy Year Cross on David Stapleton's C walk above Clonmel on Sunday, December 14th, 2014. 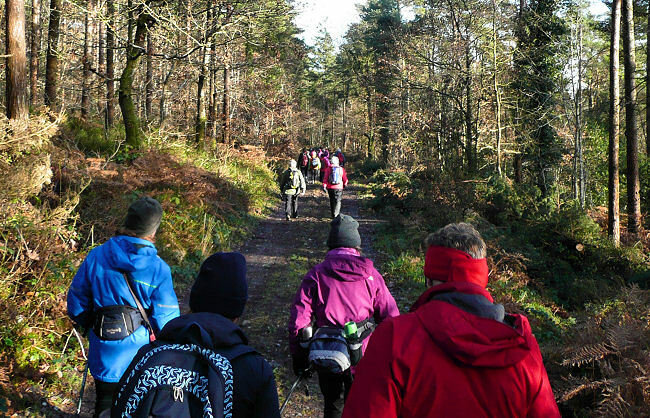 Thanks to Eddie McGrath for the B walk from Christ the King on Sunday last in excellent weather for walking the forest tracks of Slievenamuck. Later on Sunday evening several club members attended the annual Winter Solstice climb of Slievereagh from Glenbrohane. Well done to Mary and Morgan, the Hillwalking Radio Group, the Red Cross, the Glenbrohane community and all others who contributed to this well organised event. To round off the year there will be the traditional 2.5 hour walk on Christmas Morning with Ray Coleman, meeting at Christ The King Statue at 10am and a longer 4 hour walk on St. Stephen’s Day with Danny Bailey from Bansha Woods car park, meeting at 11:30am. Brendan ans Sadie after the Winter Solstice climb of Slievereagh with the Limerick Senior County Football cup which was won by Ballylanders in 2014. Photo of Ray Coleman's Christmas Day walk taken by Helena Nugent on her first day out with the club. 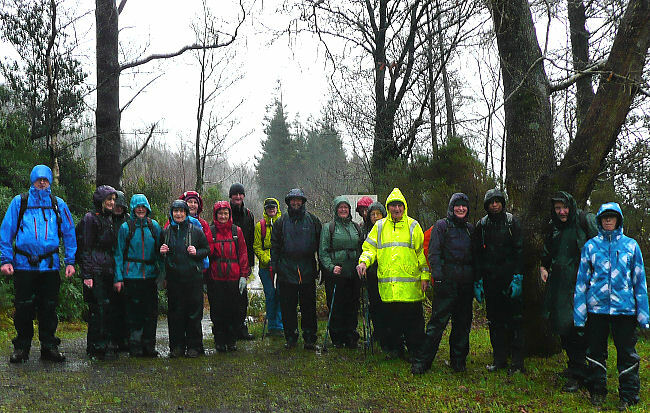 Danny Bailey's walk from Bansha Woods on St.Stephen's Day, December 26th, 2014. Photo, Helen Gleeson.